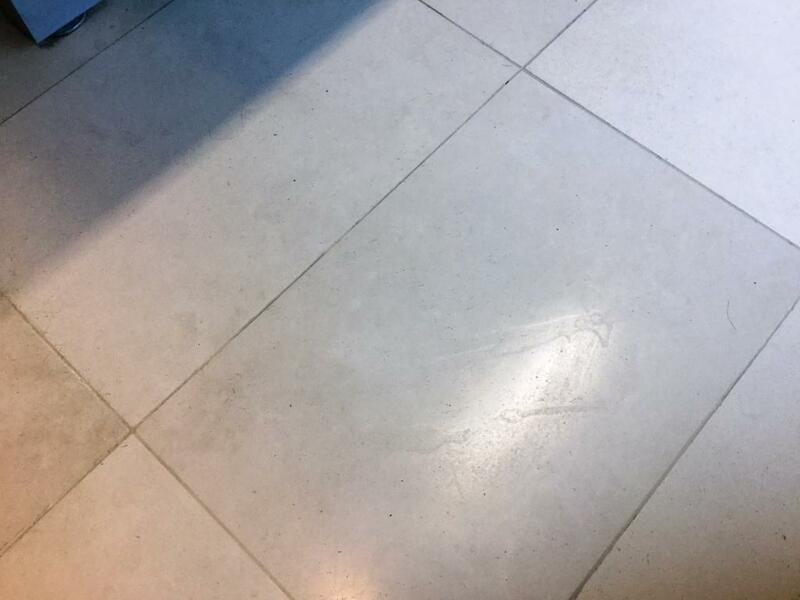 We often come across tiled floors that have simply never been maintained after their original installation. 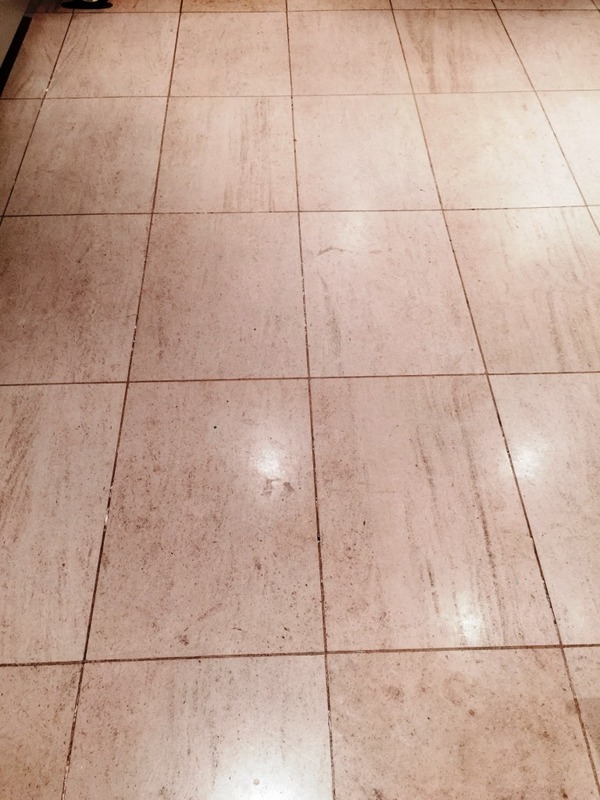 This inevitably leads to problems: over time, the sealer starts to wear away, particularly in high traffic areas, allowing dirt and staining to become easily ingrained in the stone and grout. The longer this is left unaddressed, the harder it becomes to clean the tiles. 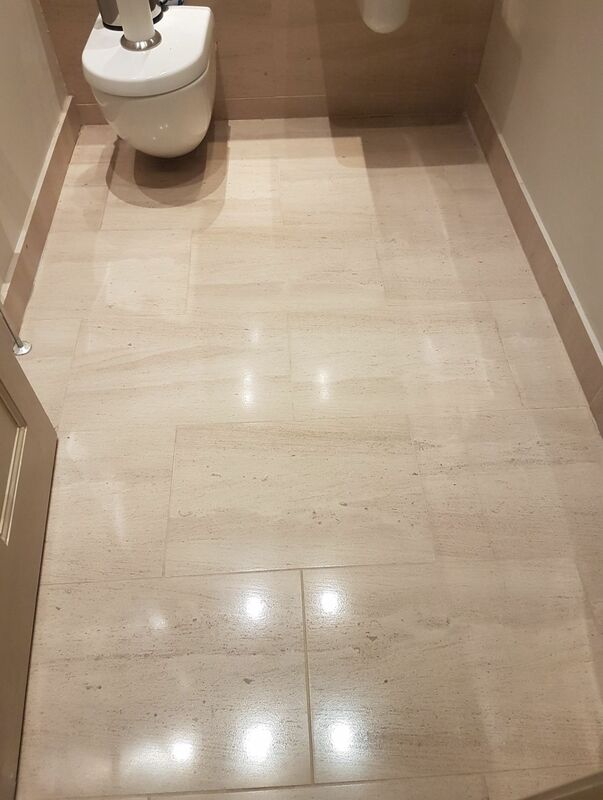 An excellent case in point are this cream coloured Polished Limestone tiled floor installed in the downstairs WC and upstairs bathroom of a property in the prosperous Merchiston area of Edinburgh. 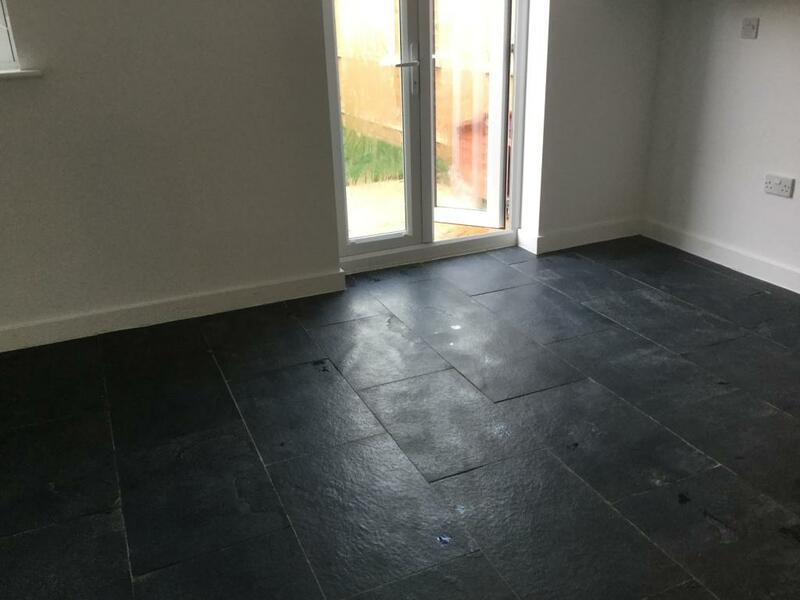 The floor were already laid when the customer bought the house 10 years ago, and as far as they know, it has never experienced professional maintenance. The result of this is quite clear: just looking at the photos below you can see how dull and unimpressive the tiles looked before I was called in to restore them to their best possible condition. 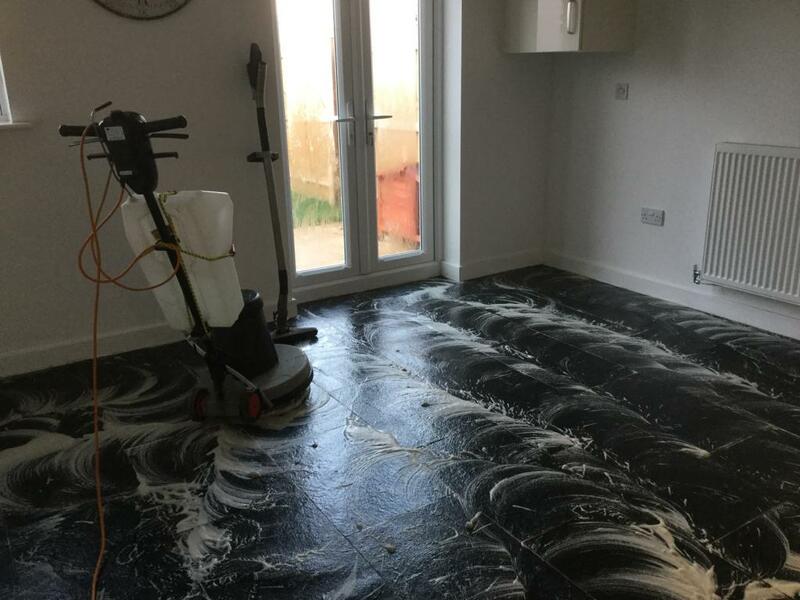 The customer was particularly unhappy with how easily the floor became stained and patchy where the sealer had failed in certain areas of the floor. 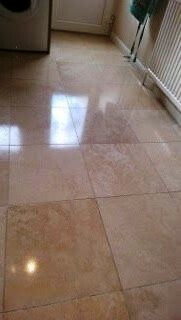 To clean the Limestone tiles, I used Tile Doctor’s system of four diamond encrusted burnishing pads, which range from Coarse to Very Fine. The abrasive Coarse grit pad are applied to cut back through the stone to remove stains, while the Fine and Very and Fine pads are applied to achieve a high quality polished shine. The pads are fitted to a rotary machine in sequence from coarse to fine and lubricated with a small quantity of water which is sprayed onto the surface. The resultant slurry is rinsed off with more water and extracted using a wet vacuum. 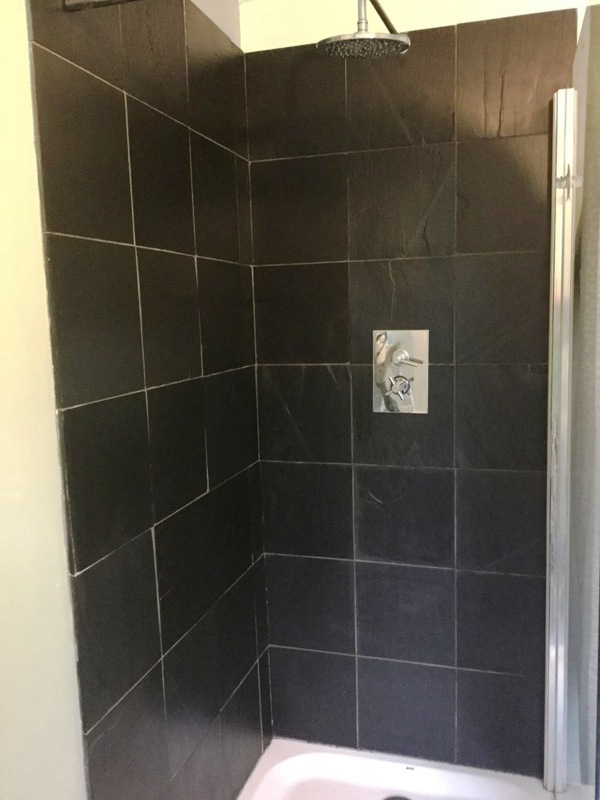 The downstairs WC was approached using much the same method except the space was tighter so we had to use smaller six-inch burnishing pads fitted to a handheld buffer. 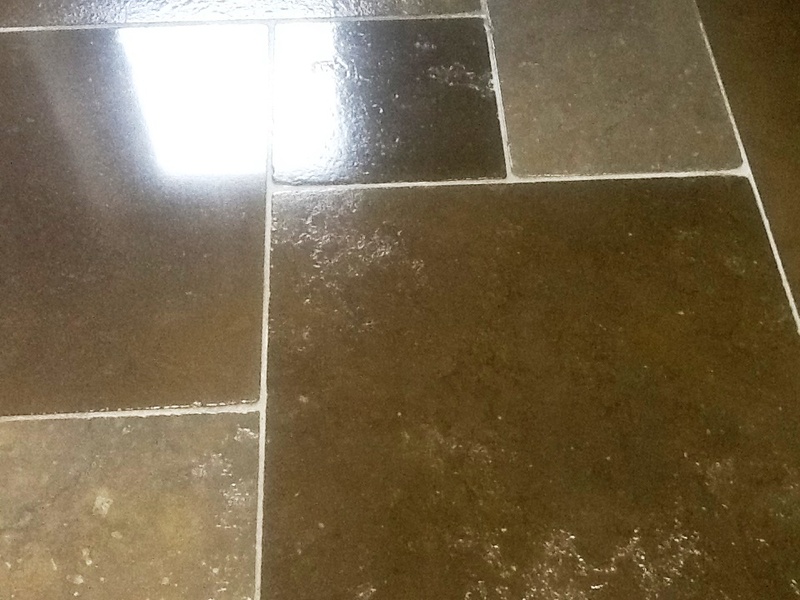 After completing the burnishing process, I scrubbed the grout with a narrow brush and a strong dilution of Tile Doctor Pro Clean, which is a high performance alkaline cleaner, to remove any dirt and stains. Last step before leaving was to rinse both floors with water to remove any trace of cleaning solution. The wet vacuum was then used to remove as much water and moisture from the tiles as possible. I left the floor to fully dry out overnight before returning the next morning to re-seal the stone which would protect it from future staining. 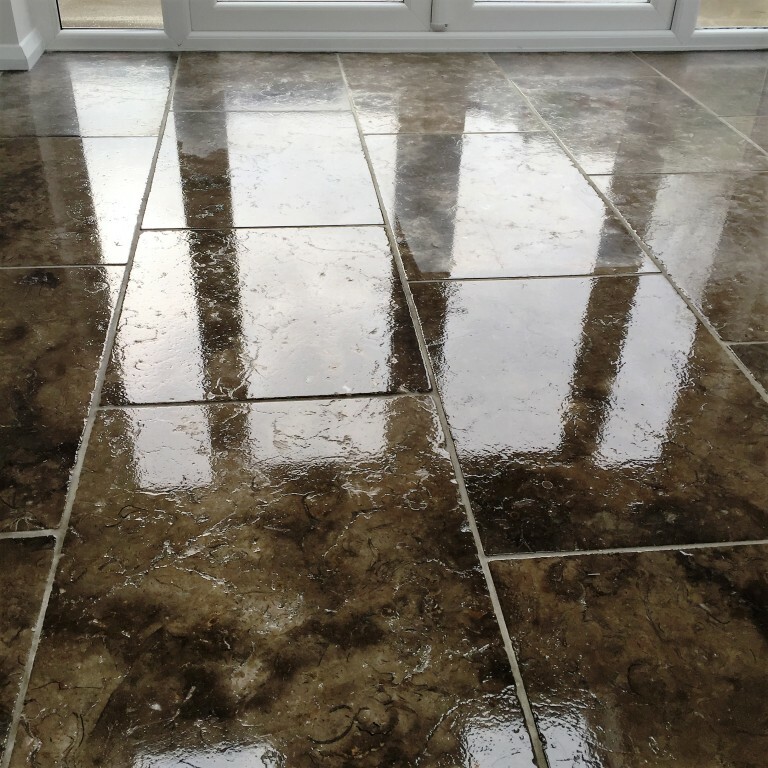 My choice of sealer was Tile Doctor Colour Grow, which is the ideal sealer for sealing Limestone. As an impregnating sealer, it penetrates deep into the pores of the stone to fill them and prevent dirt from becoming ingrained there. It also subtly enhances the natural shades in the stone. The customer was delighted with the job as both floors were completely transformed. 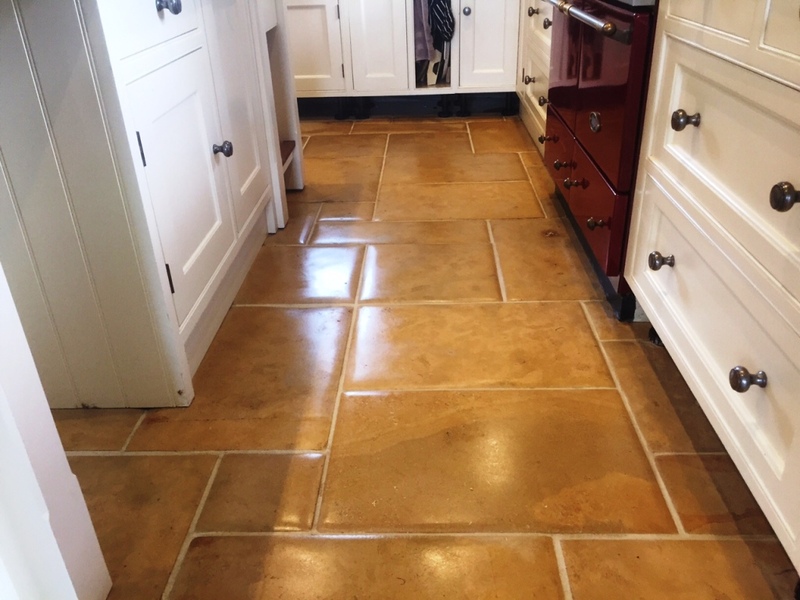 It’s sometimes hard to believe how long some tiles go without proper maintenance, but it’s equally amazing just how quickly they can be rejuvenated with the right products and methods! 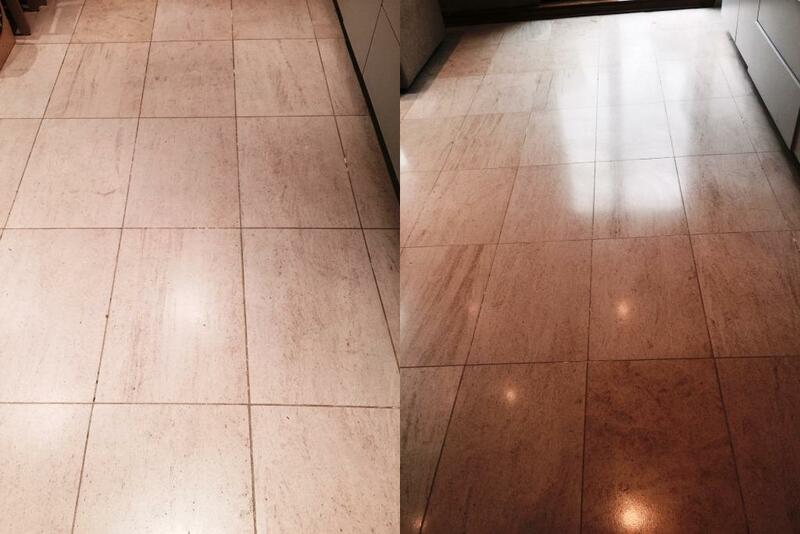 The following photos show a modern Limestone tiled floor that had been damaged by the office cleaner. Bit of a long story but basically the cleaner had inadvertently placed a bottle of a strong cleaning chemical which was leaking in a bin liner, that then proceeded to leak onto several areas of the floor as he walked around the office. 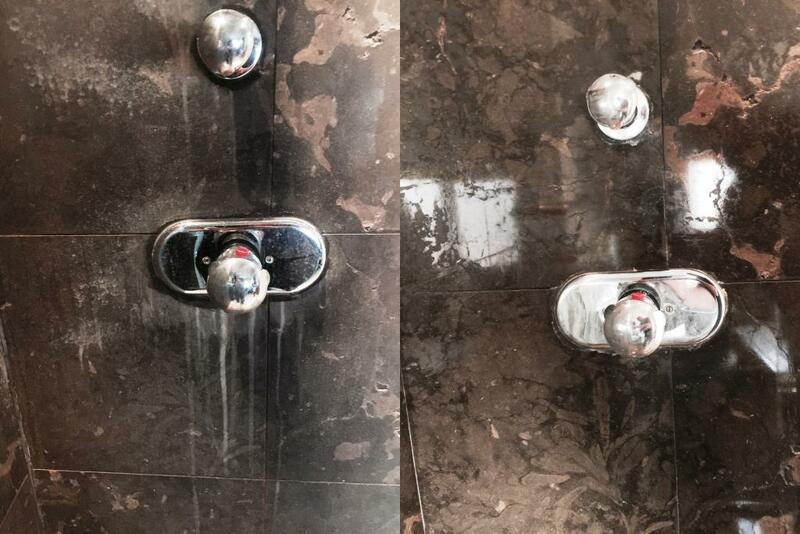 The chemical soaked into the Limestone tiles unnoticed causing damage and acid etching. 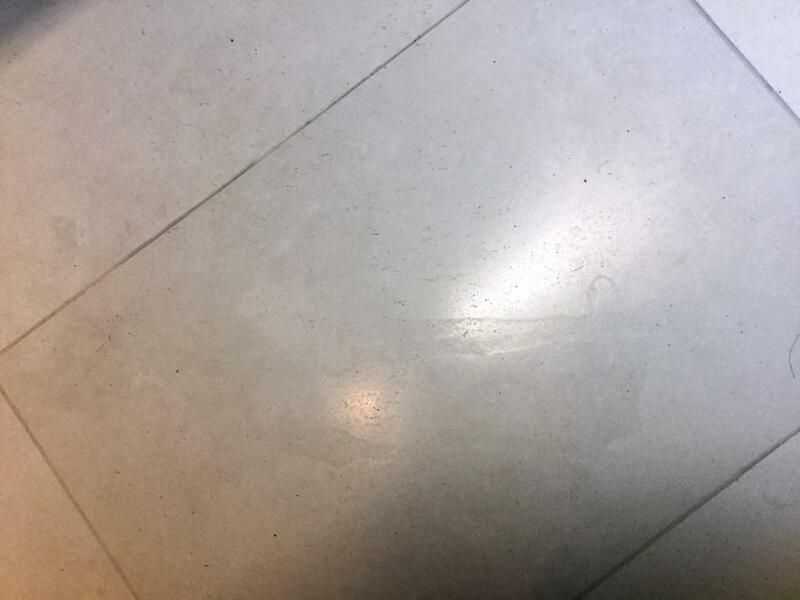 These close-up photos below show the damage, which couldn’t be removed with normal cleaning products and required machine cleaning the floor with the Tile Doctor burnishing pad system as well as hand held Tile Doctor diamond blocks to get into the edges. Due to it being a busy office environment it wasn’t possible to do work during the week so the work was booked in for the weekend. The process used for cleaning and restoring these floors was to use hand held diamond blocks starting with 100 grit and polishing out the acid etching lines using small amounts of water, I then repeated this process with a 200 grit block graduating the cleaned area to blend in before switching to the machine to apply the burnishing pads. The burnishing pads are applied from coarse to fine starting with a coarse 400 grit pad that removes old sealers and dirt. The floor was rinsed and then then the 800 grit pad was applied which is the first step in restoring the polish to the Limestone, this was followed by the finer 1500 grit pad which brings up the polish even further and giving the whole area a consistent appearance. One of the benefits of using this system is as no chemical are required, only a little water to help lubricate so it’s extremely environmentally friendly. After applying the third pad the floor was given a thorough rinse with water to remove any soil produced by the burnishing process. The water was then extracted from the floor using a wet vacuum and left to dry off overnight. I returned on the Sunday to polish the floor to a high shine with the last very fine burnishing pad which is 3000 grit and is applied without any water. Once complete the floor was sealed using Tile Doctor Ultra Seal which is a premium hard wearing sealer that provides a natural finish. I appreciate it’s tricky to see the difference in these photographs but hopefully it’s comforting to know that if you have a similar problem it can be resolved. Prevention of course is better than the cure of course so be wary of acidic products especially supermarket cleaning products which tend to have acidic formulas that will reduce the life of your sealer and damage the stone floor over time. Bridgwater is known to be one of Somerset’s liveliest towns. With a history dating back over 1000 years, it has many traditions, including a carnival which happens every November, and is hailed as the world’s largest illumination procession. 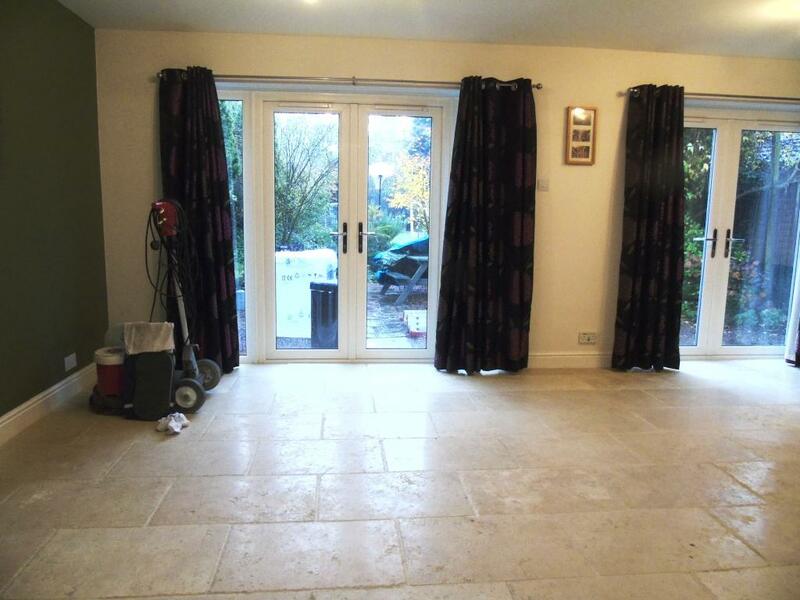 What wasn’t looking lively, however, was this Limestone tiled kitchen floor at a house in the town. It had been laid five years previously but at the time of laying hadn’t been sealed with adequate amounts of sealer. 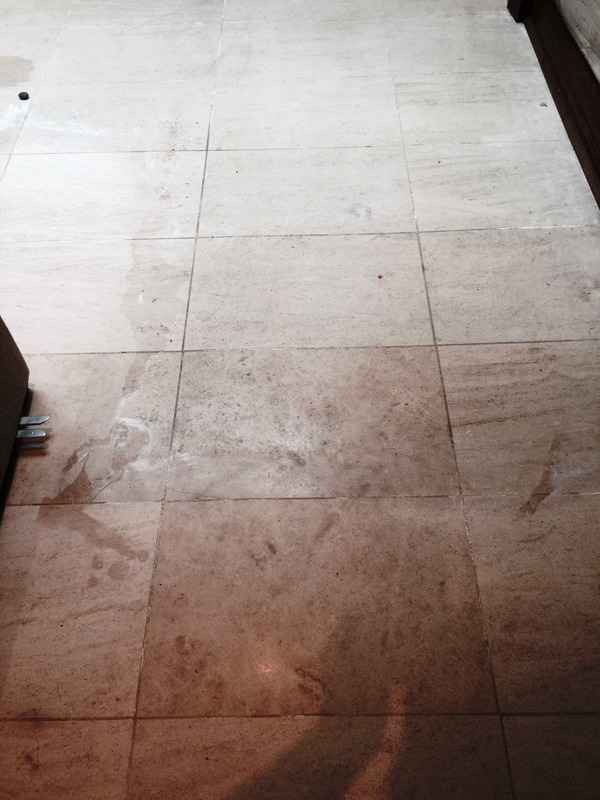 As a result, the Limestone had absorbed a lot of wet footprints and other dirty stains. The sealer simply broke down after a while, leaving the homeowner with a floor that never looked clean no matter how much they cleaned it – using all kinds of products. 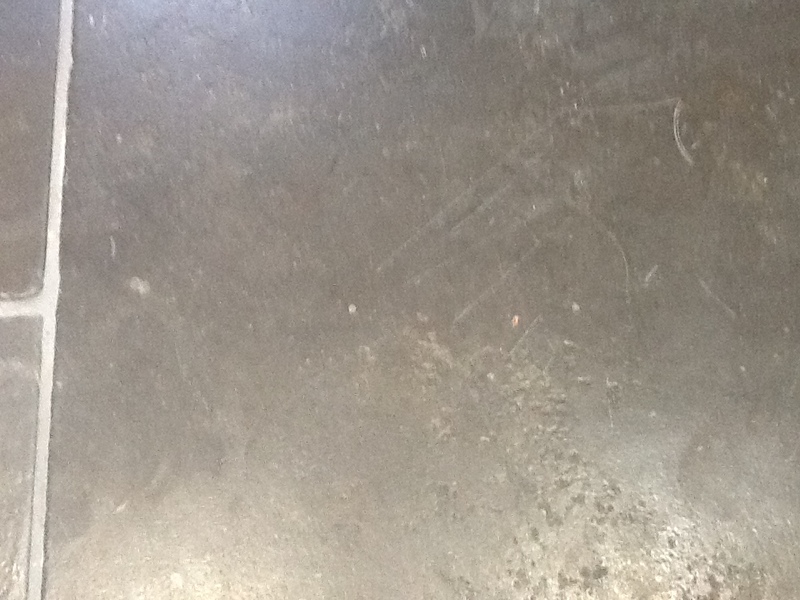 In fact, the tiles looked blackened and mouldy, as you can see in the photos below. It was time for the homeowner to seek out professional assistance, so she decided to contact her local Tile Doctor. I was asked to completely restore the look of the floor – something the homeowner had deemed impossible at this point. 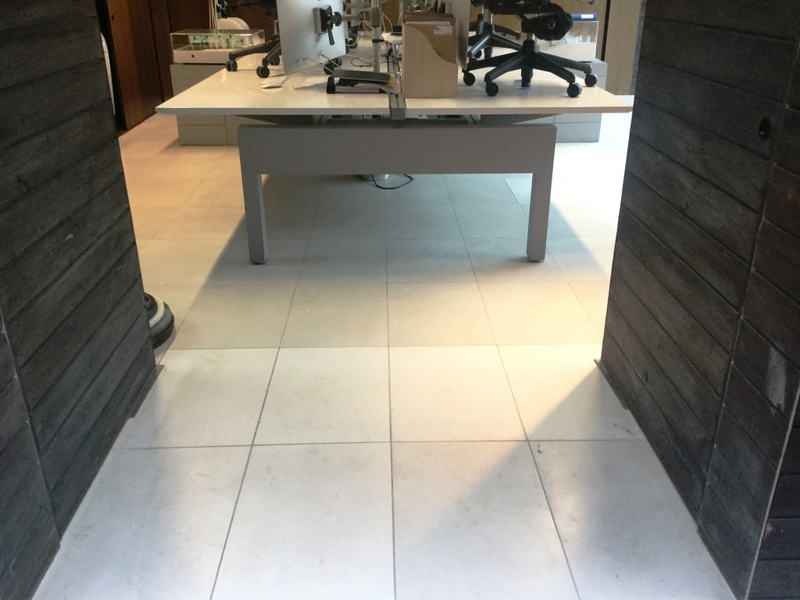 In practice, I knew the floor could be restored using the right products and methods including a really deep clean and resealing with the right type of sealer for these tiles. 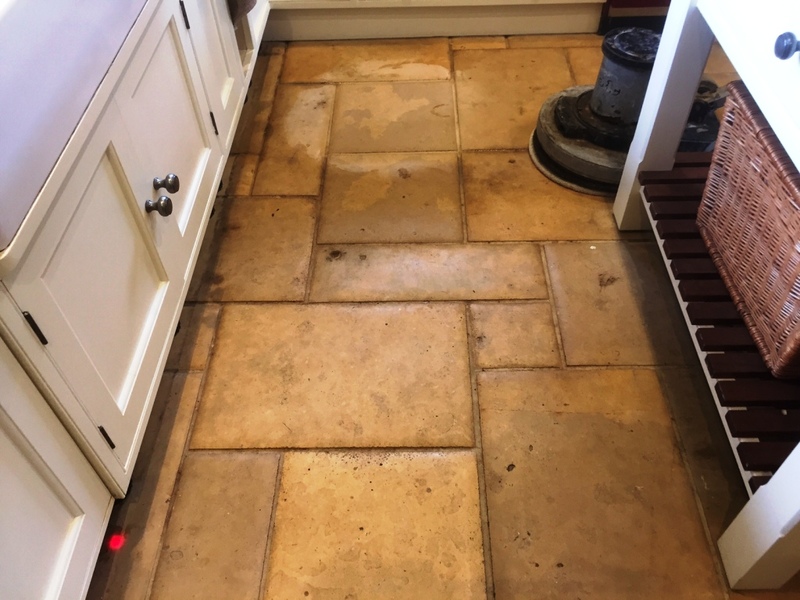 I scrubbed in Tile Doctor Remove and Go, which is a powerful coatings remover which draws out ingrained stains and strips away any old sealer remaining on the tiles. The floor was then rinsed thoroughly with plain water to neutralise it, and the resulting soiled solution was extracted using a wet vacuum. 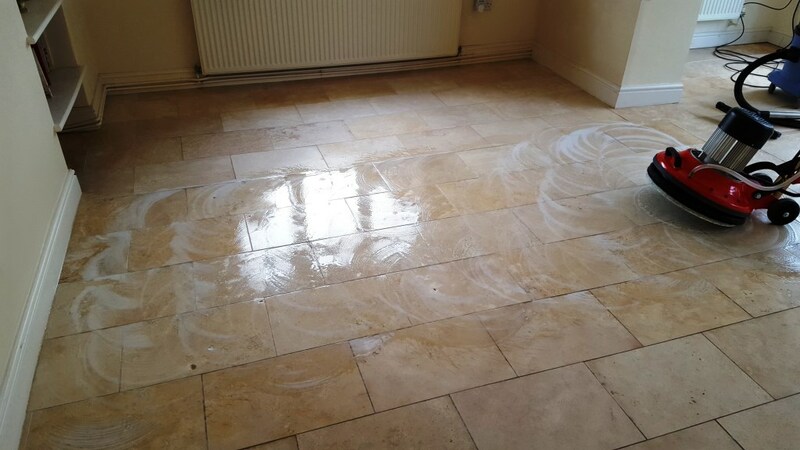 I repeated the process on stubborn areas, eventually transforming the floor back to its natural and clean state. 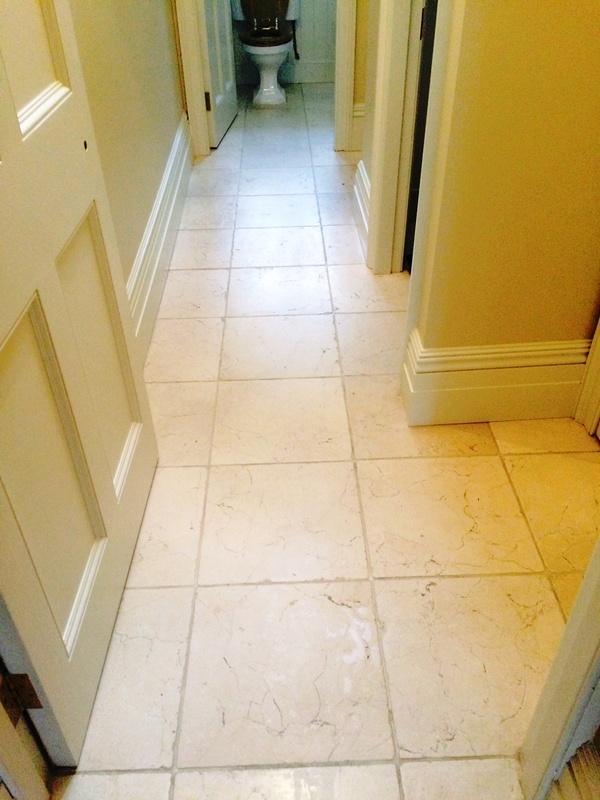 I allowed the Limestone to dry out completely overnight before returning to the property to seal the tiles. This is important as the slightest amount of excess moisture can damage the performance of the sealer, and we would’ve been back to square one! 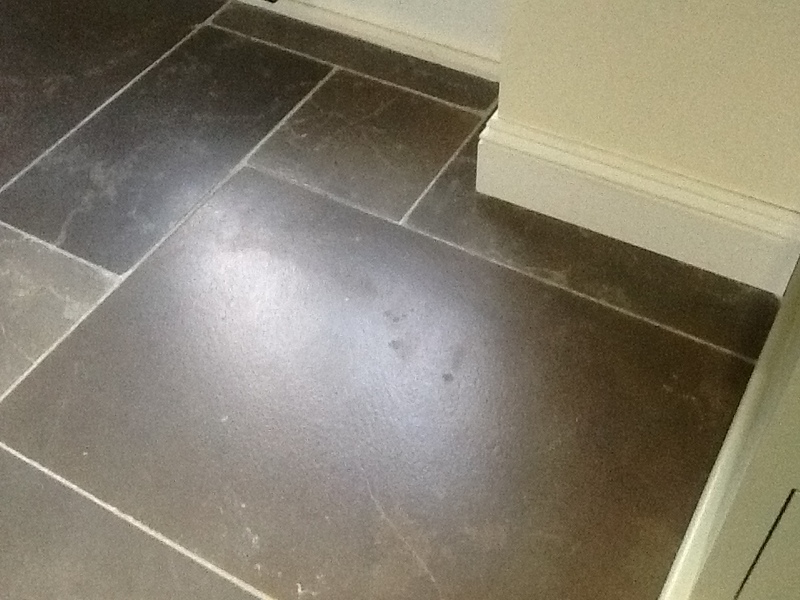 After checking with a damp meter, I could see everything was fine, so I proceeded to seal the floor with Tile Doctor Colour Grow, which is not only a robust impregnating sealer that will protect the floor going forward but also enhancing the natural colours in the stone at the same time. 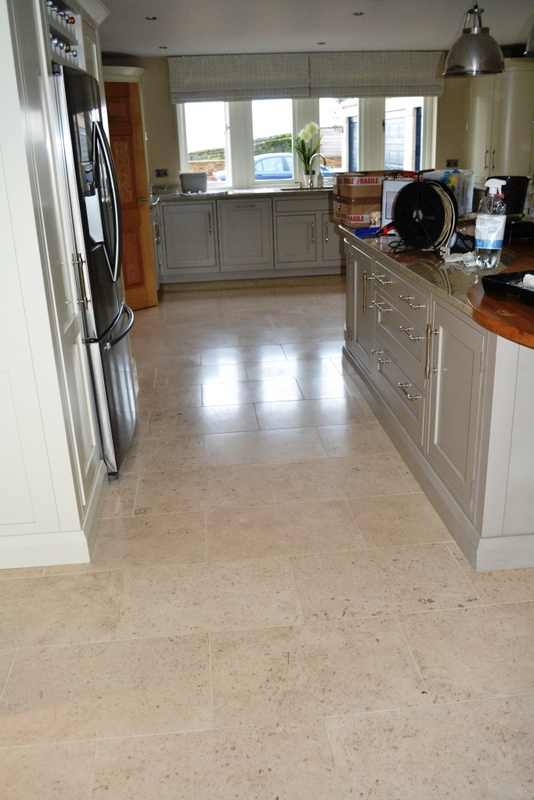 In the space of two days, the Limestone tiles had been completely transformed. Now it had been properly sealed, the floor will be much easier to clean and therefore should stay looking great for a long time to come. 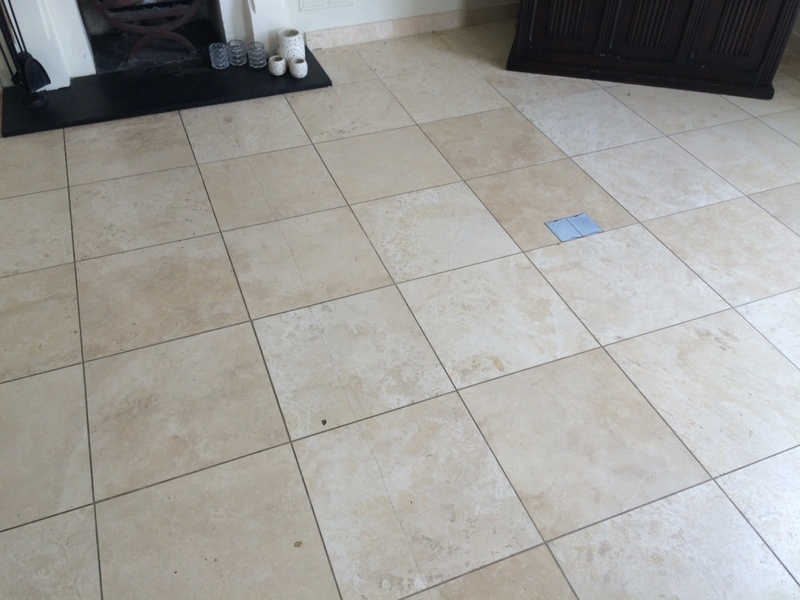 The customer was very happy to have finally resolved the problem with some assistance from the Somerset Tile Doctor! 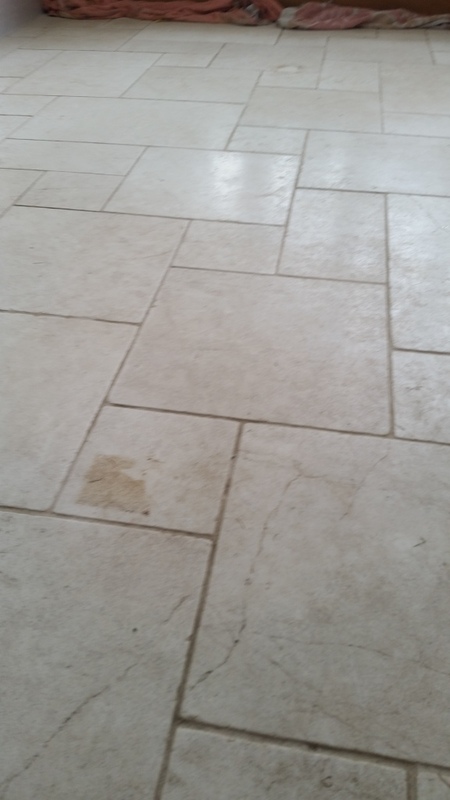 I appreciate my photography is not the best but hopefully if you take a close look at the lower half of the picture below showing a dull Limestone floor tiles you can see a couple of long cracks in the tiles. 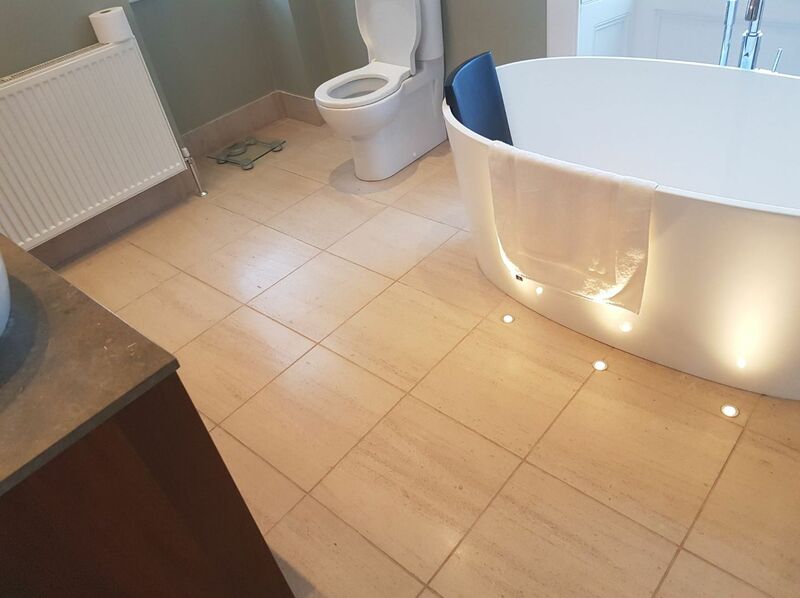 The picture was taken at a house in Hornchurch which is in the East End of London; we had been asked round to see if we could repair the cracked tile and put some new life into the floor. To begin I gave the floor a thorough clean using Tile Doctor Pro-Clean worked in with a black scrubbing pad fitted to a rotary machine. I wanted the floor clean before I tacked the cracked tiles and this would also ensure any grit etc. would be removed from the floor before I started the polishing process. After cleaning the floor was rinsed with water and the soiled cleaning solution extracted using a wet vacuum. 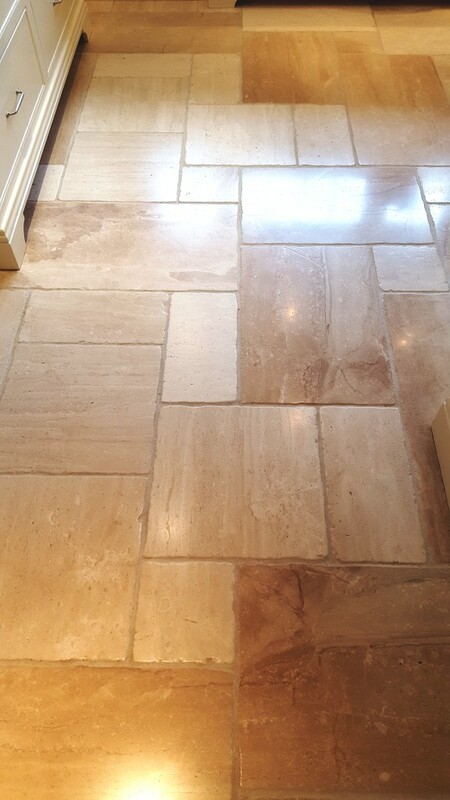 I should mention Pro-Clean is a versatile, alkaline cleaner recommended for cleaning natural stone floors such as Limestone. The crack was then filled using a special stone glue and hardener. Once the glue had hardened we started to restore the appearance of the Limestone using a set of diamond encrusted burnishing pads which you apply in sequence from coarse to super fine with a little water for lubrication and a rinse with water in between. It takes a while to do but it does a great job of bringing back the polish on the tiles. 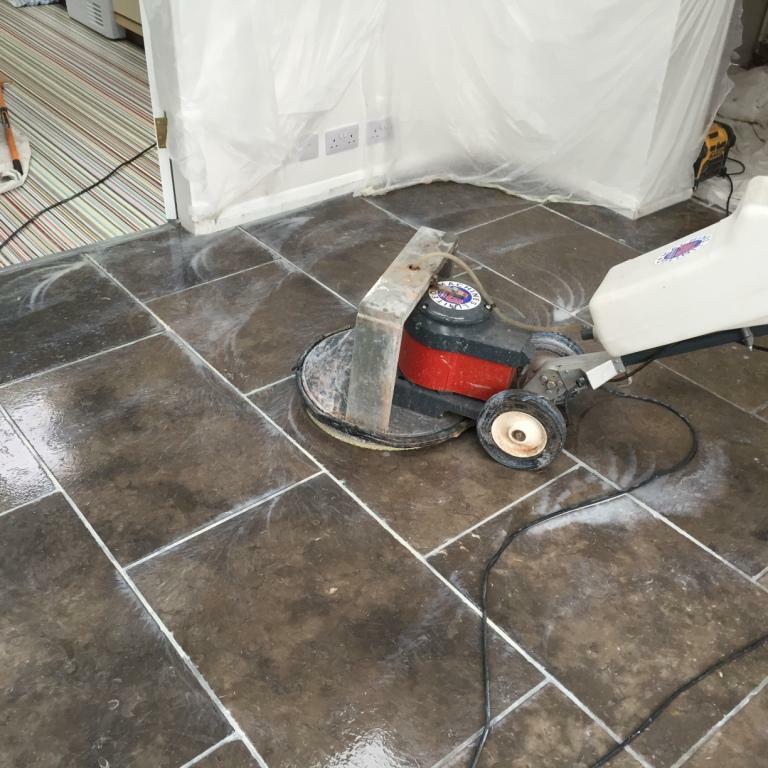 Once we were finished burnishing the next step was to apply Tile Doctor Shine Powder into the tiles, the shine powder is worked in using a white buffing pad attached to a rotary machine running on slow speed. It adds more depth to the polish and forms a very durable finish. Last step was to finish the floor by sealing it with Tile Doctor Colour Grow, Shine Powder works as a sealer too but Colour Grow gets deep into the pores of the stone protecting it from within and enhancing it’s natural colours. As you can image the owner of the property was very happy with the results and with the added protection of Shine Powder and Colour Grow it should stay that way for some time to come. 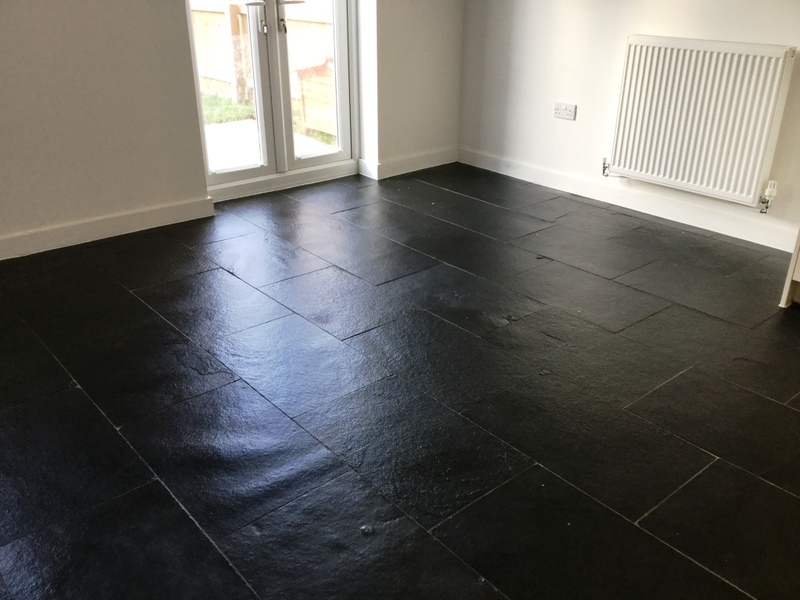 Believe it or not the pictures below show a brand-new installation of black Limestone tiles in the kitchen and dining room of a house in Wixams which is a new town right in the centre of Bedfordshire. The tiles looked terrible and on closer inspection I could see that they were heavily covered with grout haze. 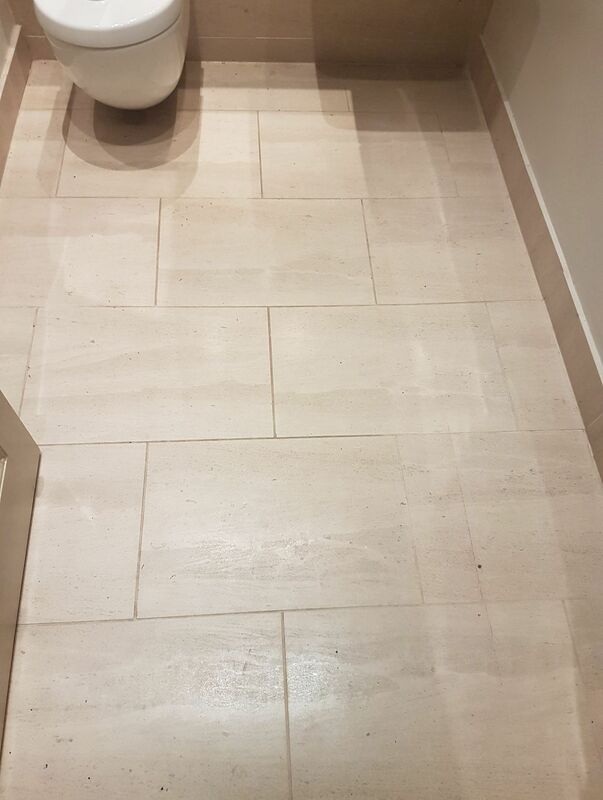 The customer thinks the tiler was in a hurry to get the job finished, unfortunately if not washed off immediately and allowed to dry before sealing grout haze can become a real problem. To make matters worse the tiler had sealed over the top of the grout haze hoping to hide his mistake which simply made the problem worse. The property was a new build so the client called in the site foreman to rectify the issue and he was advised to get someone out to assess whether anything could be done. When I returned on site I masked up the kitchen units to protect them and then sprayed on a solution of Tile Doctor Pro-Clean to break down the sealant before washing and rinsing aided by a rotary machine fitted with a scrubbing pad and a wet vacuum to extract the soiled solution. 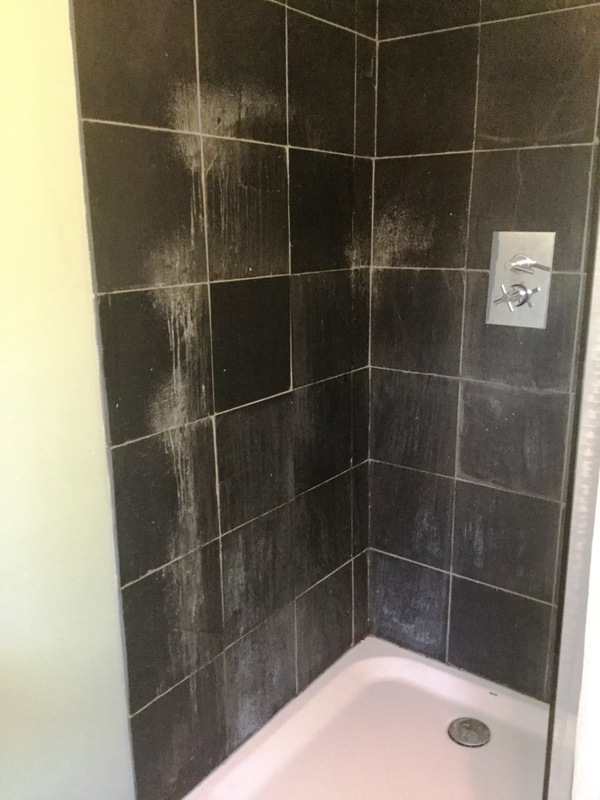 Once the sealant was removed I was able to tackle the grout haze by applying Tile Doctor Grout Clean up diluted at a ratio of 3:1, I needed a strong solution as the grout smears were quite significant. The solution was allowed to dwell for a few minutes before agitating and adding more water before rinsing. I worked in areas of 3 square metres at a time so as not to leave the product on the floor too long until the whole floor had been treated. After I was happy all the grout haze had been removed the floor was given a final rinse and as much moisture removed from the floor as possible with the wet vacuum. One this had dried I proceeded to seal the floor with two coats of Tile Doctor Colour Grow sealant, each coat was polished in by hand leaving an hour for drying between coats, I then waited another hour before giving the whole floor a final polish with a buffing machine to remove any excess sealant. 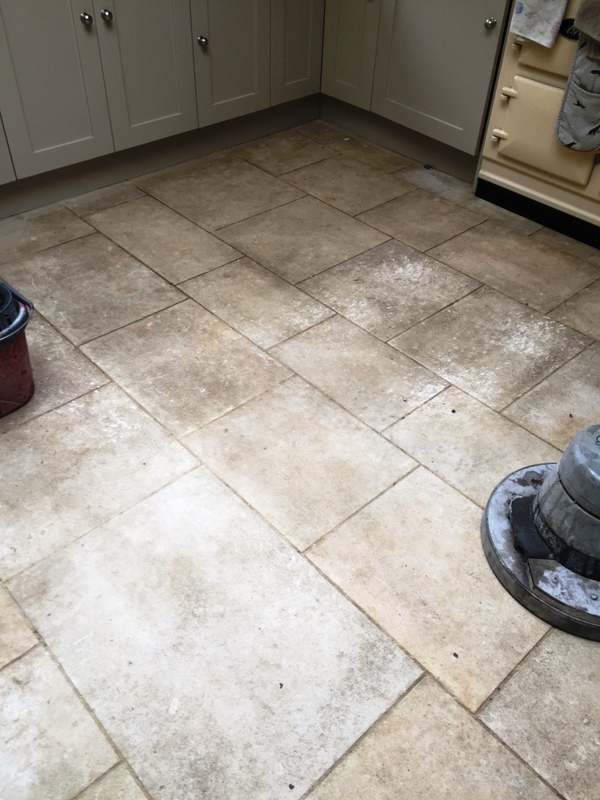 The result was quite a transformation and the customer was very happy, I also provided advice on how to clean the floor in the future using Tile Doctor Neutral Cleaner which is a PH neutral cleaner designed for use on sealed stone. 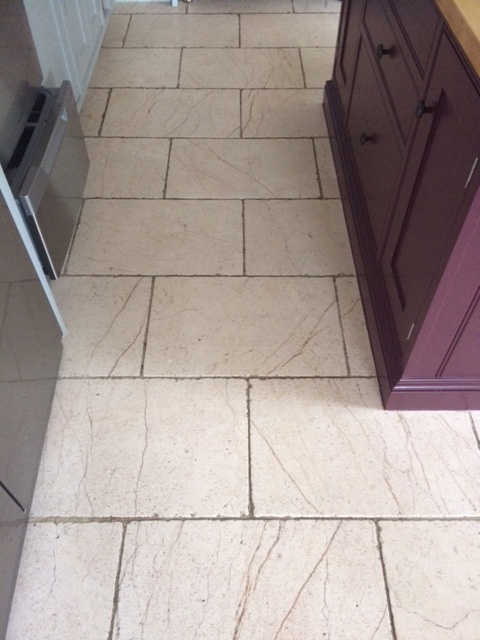 This beautiful Limestone kitchen tiled floor at a property in Peel Green was only a year old and, while it wasn’t in too bad of a state, the customer told me the floor had not been sealed properly due to issues with retaining moisture. 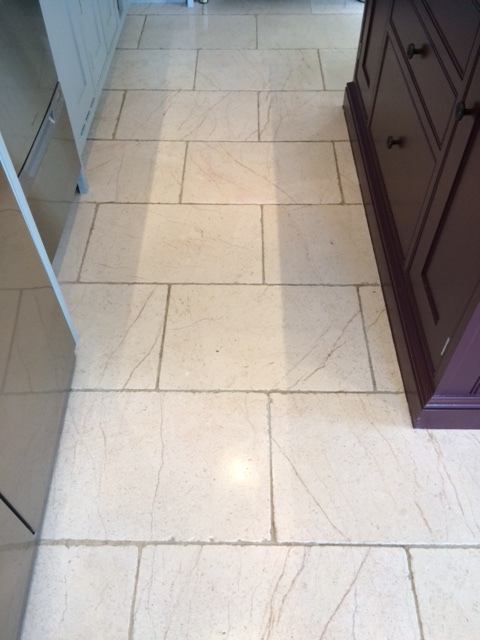 The lack of an adequate sealer had allowed the Limestone to become duller over time after exposure to dirt and muck. It also had some more obvious marks and stains in some place and needed some grouting to be done around the corners and edges of the room. I travelled to the property in Peel Green, which is within the Greater City of Salford in Greater Manchester, to see what could be done to restore the condition of the tiles. 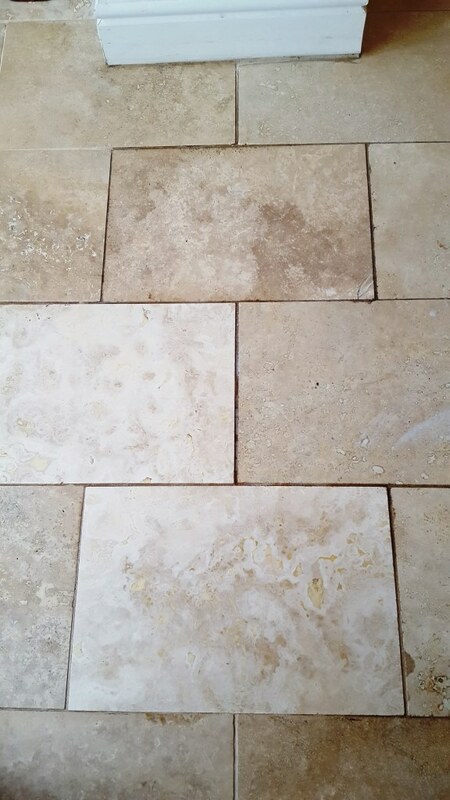 Upon closer inspection of the tiles, I recommended to the customer that we proceed with the process known as burnishing, which we use primarily on Limestone, Marble, and Travertine. Burnishing, which involves the application of diamond encrusted burnishing pads, breaks down old sealers, gets rid of marks, stains and ingrained dirt, and gradually builds and evens out the polish on the tiles. 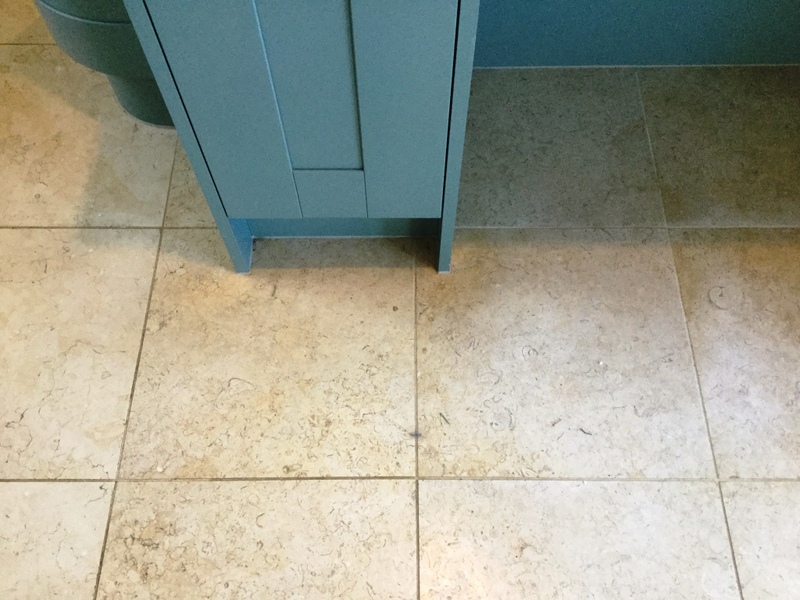 I started burnishing the Limestone kitchen tiles straight away when I arrived at the property as it was a big area and would require lots of hard work to achieve the desired results within the space of a day. Our burnishing system consists of four diamond encrusted pads: Coarse, Medium, a Fine and Very Fine. 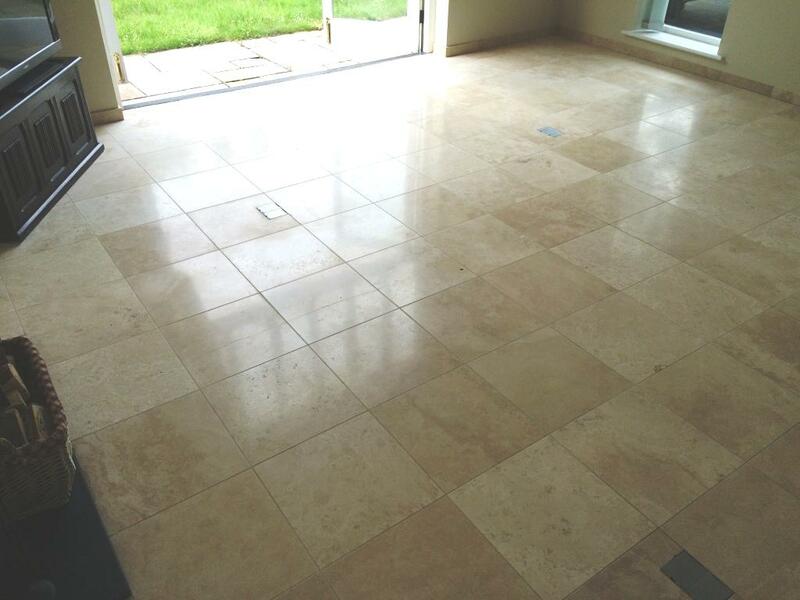 Each pad was applied to the Limestone in sequence in tandem with a small amount of water to act as lubrication, gradually smoothing and polishing the surface of the tiles. After every pad, I also used my wet vac machine to remove any dirty water left on the floor and, after the Fine pad I rinsed the floor thoroughly to remove any dirt left on floor. I then left it to dry. 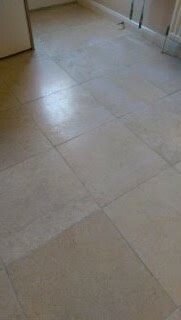 When I was satisfied that the floor was completely dry, it was time to seal the Limestone tiles. However, I first went over the floor with Very Fine grit pad to provide a final polish before sealing. 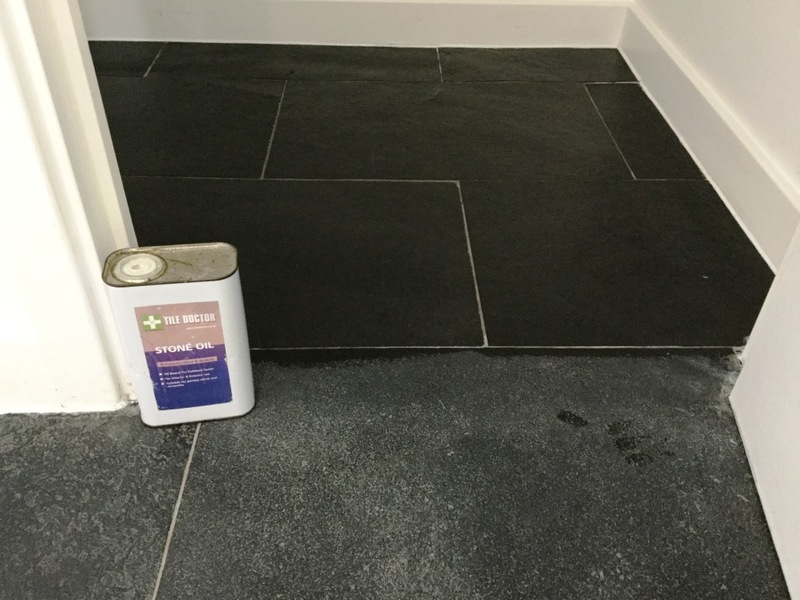 My choice of sealer was the impregnating Tile Doctor Colour Grow, a product which enhances the natural colours in the stone whilst also offering robust protection against dirt and stains. Remembering that the tiles had never been properly sealed, I applied plenty of sealer and left it to dry for 10 minutes. Following this, I carefully removed any excess sealer left on the surface with a dry cotton cloth. After sealing I went over the floor once final time with the Very Fine pad, just to smoothen things down and leave an exceptionally neat finish. When the job was finished, I gave the owner some tips and recommendations on the cleaning of the floor going forward and a complimentary bottle of neutral cleaner to get them started. 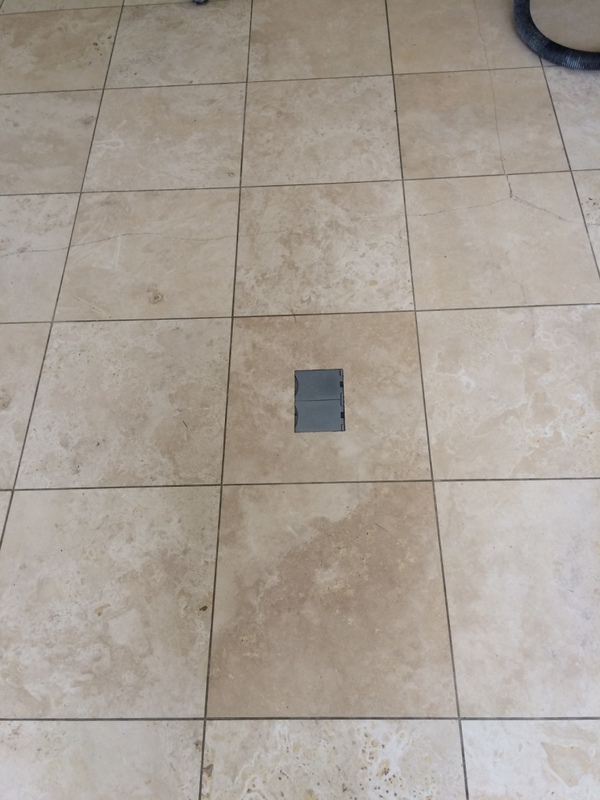 The customer was very pleased with the finish, so much so that she opted and take up the Tile Doctor Maintenance Plan to keep the floor looking good for years to come! This involves popping round every 6-12 months to top up the sealer and give the floor a quick polish. 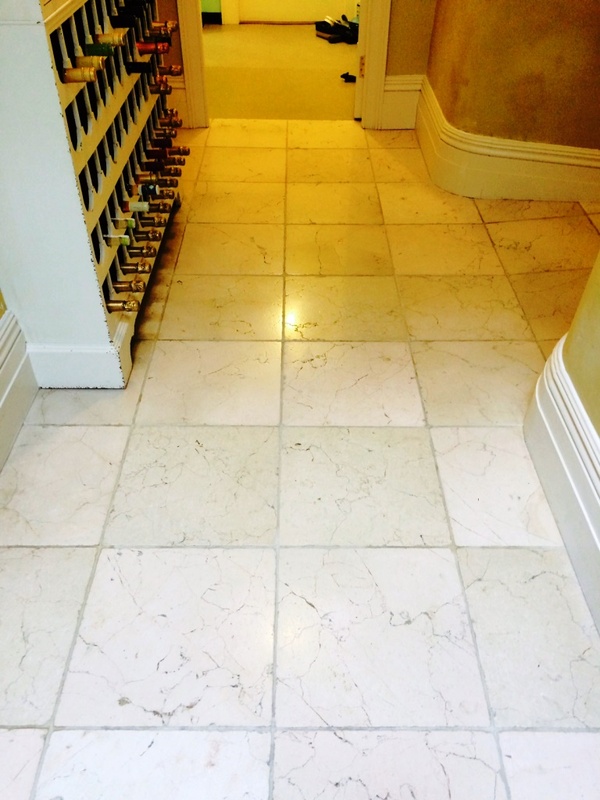 Limestone is a beautiful flooring material however it’s a porous sedimentary rock with is not as tough as its cousins, Marble and Travertine, and therefore will need more Maintenance over time. 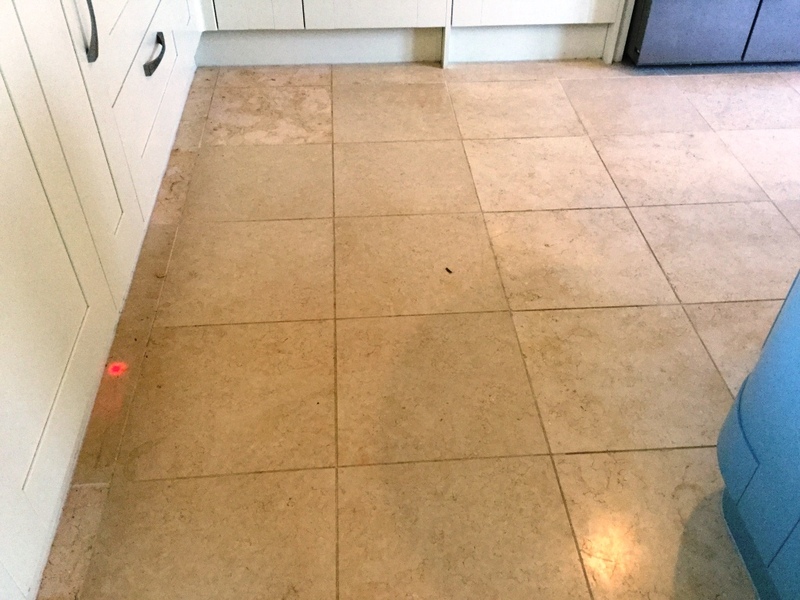 This Limestone tiled kitchen floor in Lyndhurst is a great example of how this material can lose its appearance without a regular maintenance regime in place. 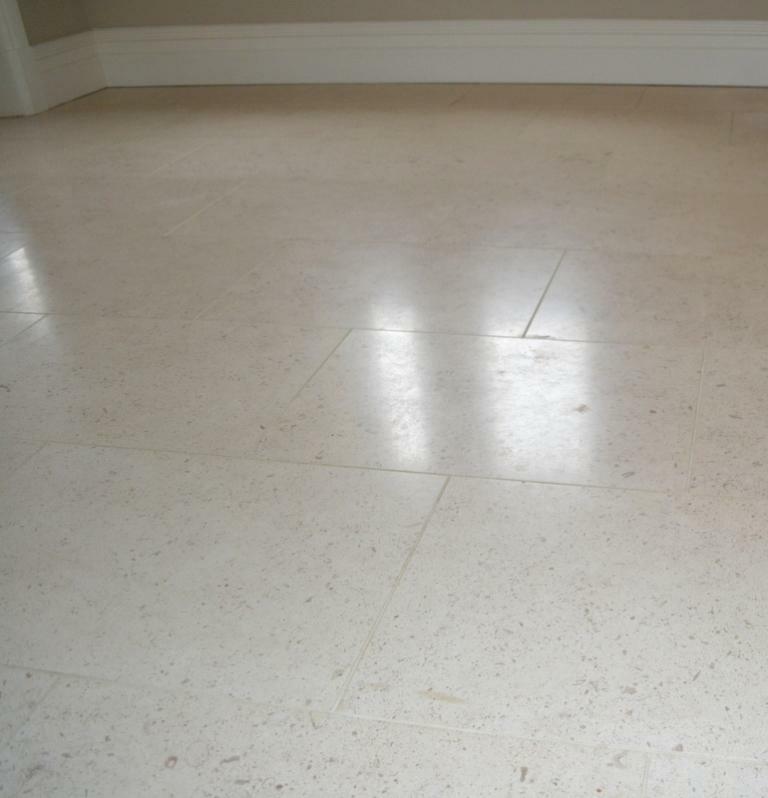 To restore the appearance of polished Limestone we use a set of diamond encrusted Burnishing Pads which effectively cut back the layer of dirt on the floor and then build back up the polish. It was a reasonably large kitchen with an island worktop to so we worked in sections removing the kick boards as we went. You can see the effectiveness of the process from the test patch below. We stated the burnishing process with the coarse pad fitted to a rotary machine and applied with a little water. The coarse pad is very good at removing dirt and old sealers from stone and once completed the resultant surface water and loose dirt is removed using a wet vacuum. 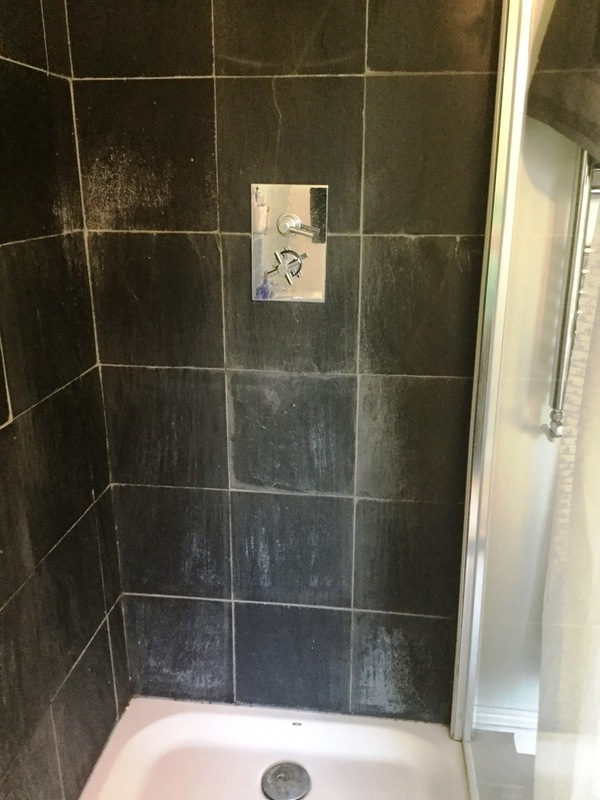 At this point the grout was also cleaned by applying a strong solution of Tile Doctor Pro-Clean which was scrubbed in along the grout lines, this is necessary as the recessed nature of the grout makes it difficult for the pads to reach it. I mentioned earlier there are four pads in the burnishing system, so once the floor was rinsed with water following the grout cleaning the other three pads were applied to the stone floor in sequence finishing on the finer polishing pads one after the other until we were left with a high shine finish. We left the floor to dry and came back later to seal the floor, the floor must be dry before sealing otherwise it can effect the performance of the sealer. 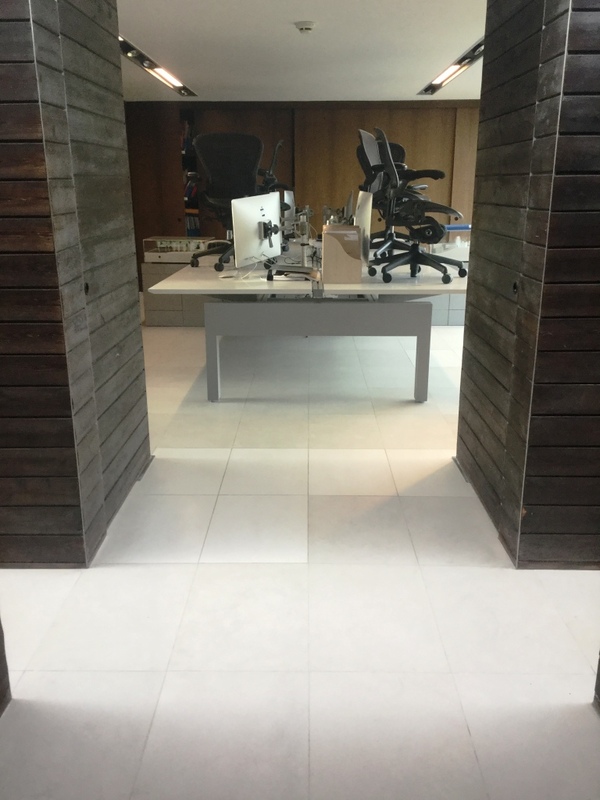 Once we were happy the floor was dry we proceeded to seal the Limestone tile using two coats of Tile Doctor Colour Grow which is a colour enhancing product that impregnates the pores of the stone bringing out the natural colours and protecting it from within. 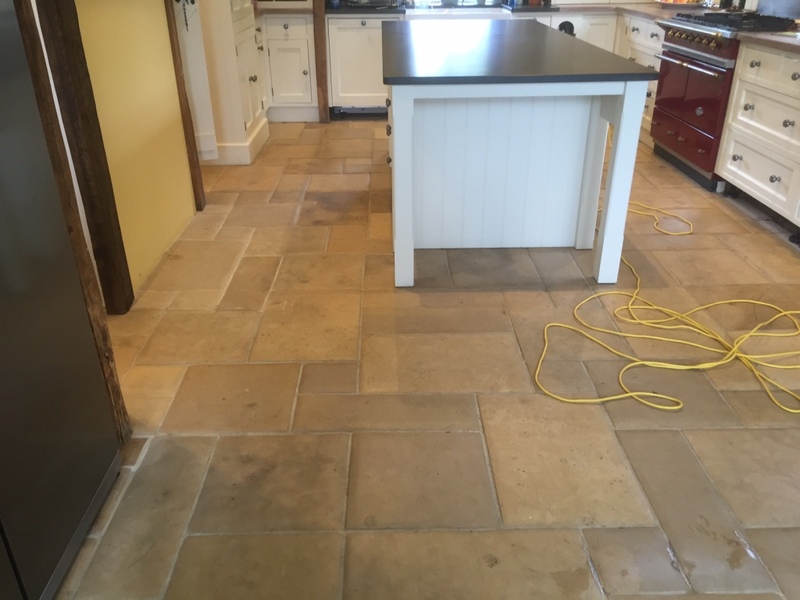 I was recently at a property in the North Yorkshire town of Harrogate, undertaking what I initially thought would be the cleaning and polishing of a Cream Limestone tiled kitchen. However, as I began the cleaning process I quickly discovered that under the dirty grout lines someone had taken a lot of effort to paint with a small brush directly onto the grout using varnish! In a normal situation, I would have covered the whole floor with Tile Doctor Remove & Go to solve the problem, however compared to, say, adhesive or paint staining, varnish is very difficult to remove. So instead I opted for the long, yet necessary process of cleaning the grout manually with several thin wire brushes. Over the course of two days I managed to remove approximately 90% of the stubborn varnish – and could finally move onto cleaning and polishing the Limestone as originally planned. 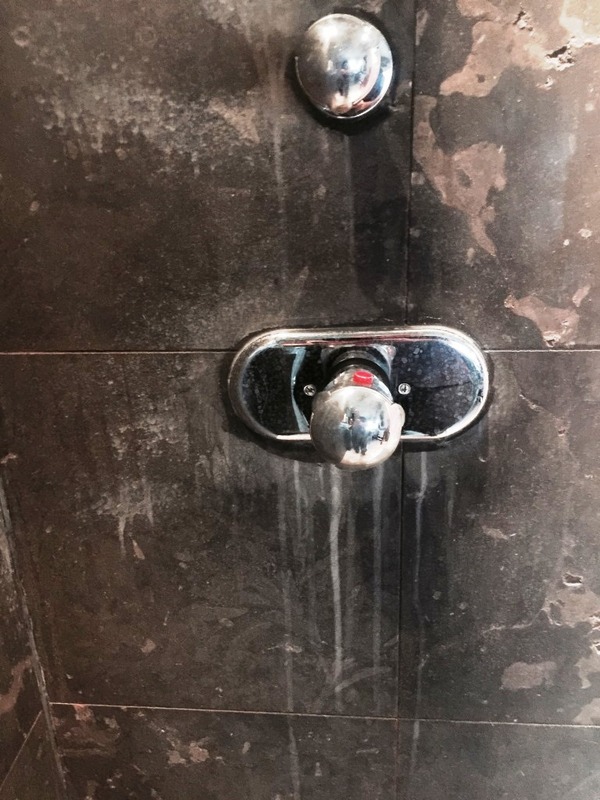 The polish had been lost from the Limestone kitchen tiles over time, so I set about restoring it using a type of polishing known as burnishing. This involves the application of diamond encrusted pads of varying grit to the floor to gradually buff the stone and achieve an aesthetic and durable shine. 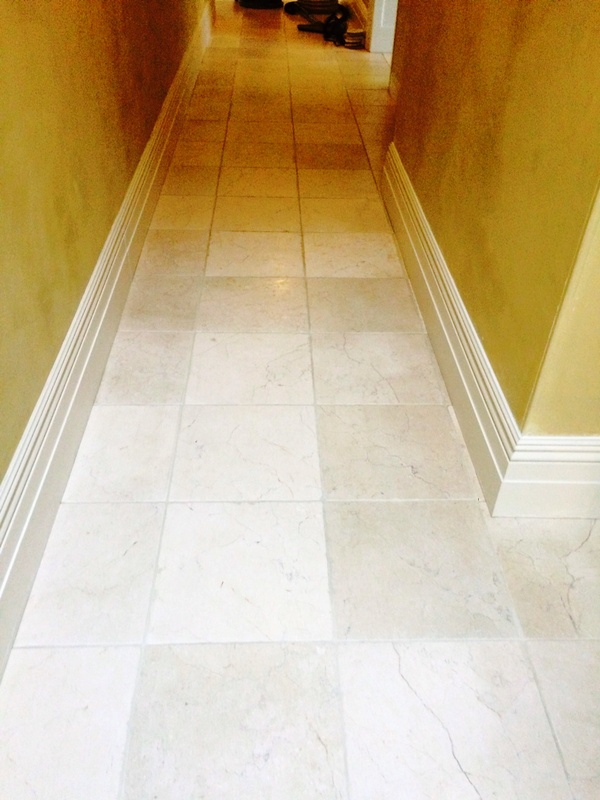 Burnishing is most commonly used on high-end stone such as Marble, Travertine and, of course, Limestone. 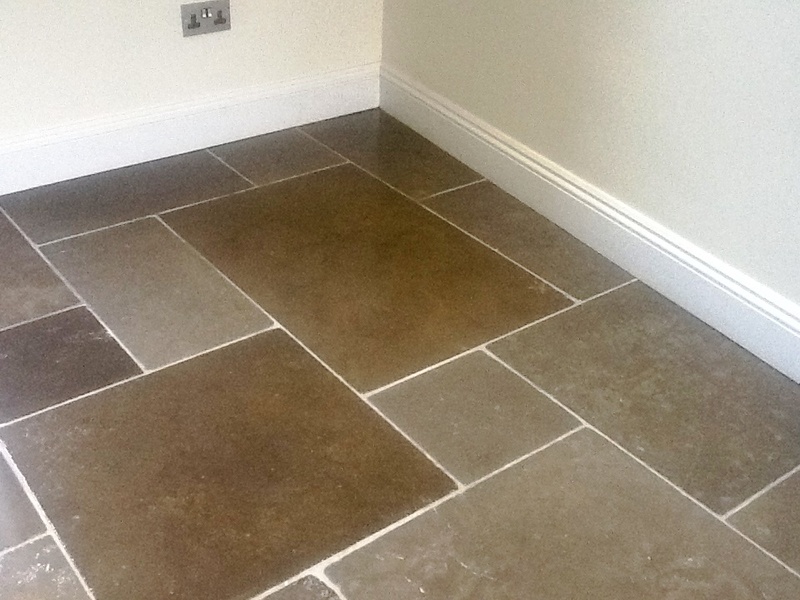 At Tile Doctor, our burnishing system comprises four burnishing pads, ranging from a Coarse grit to a Very Fine grit. 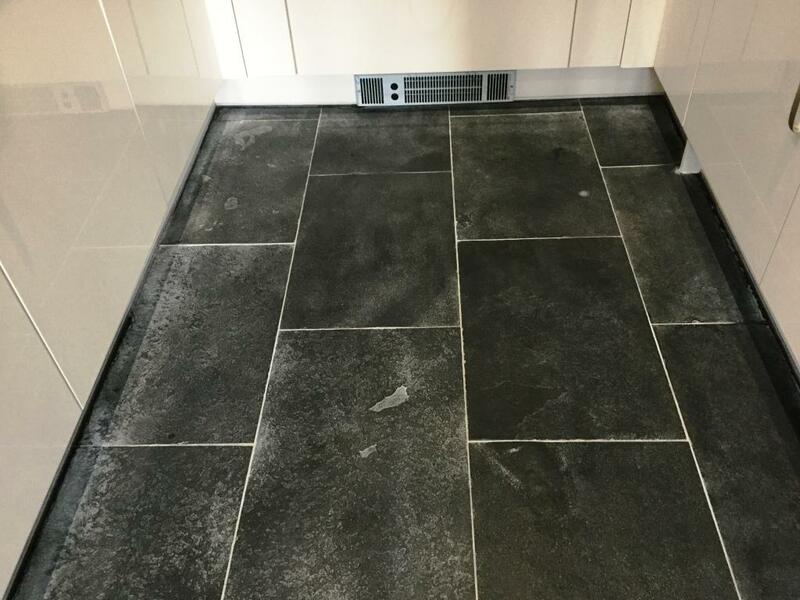 After applying the first three pads (Coarse, Medium and Fine), I gave the tiles a further clean with Tile a Doctor Pro Clean, which is our alkaline cleaner, to remove any residue from the burnishing process. I then rinsed the floor with clean water and soaked up the residue with a wet vacuum, before leaving it to dry. The floor was then polished to a satin finish using the fourth and final Extra Fine burnishing pad. I sealed it using a couple of coats of Tile Doctor Ultra-Seal, an impregnating sealer designed to provide maximum protection against dirt and stains. 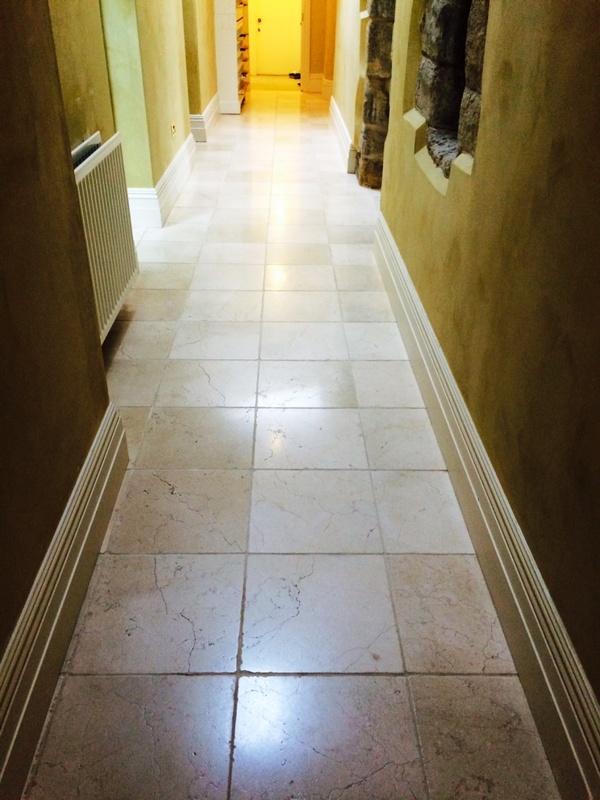 The combination of burnishing and sealing always makes a huge difference to Limestone tiles. Here, the finished result was almost like a new floor! The customer was both amazed and very pleased with the transformation. 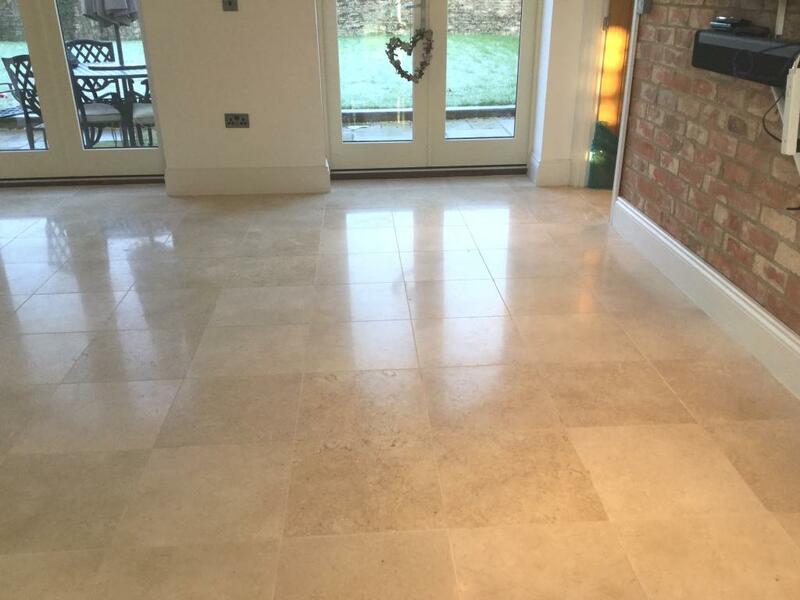 These Limestone tiles had been laid in a modern property in Witham, an Essex town that sits between Chelmsford and Colchester. 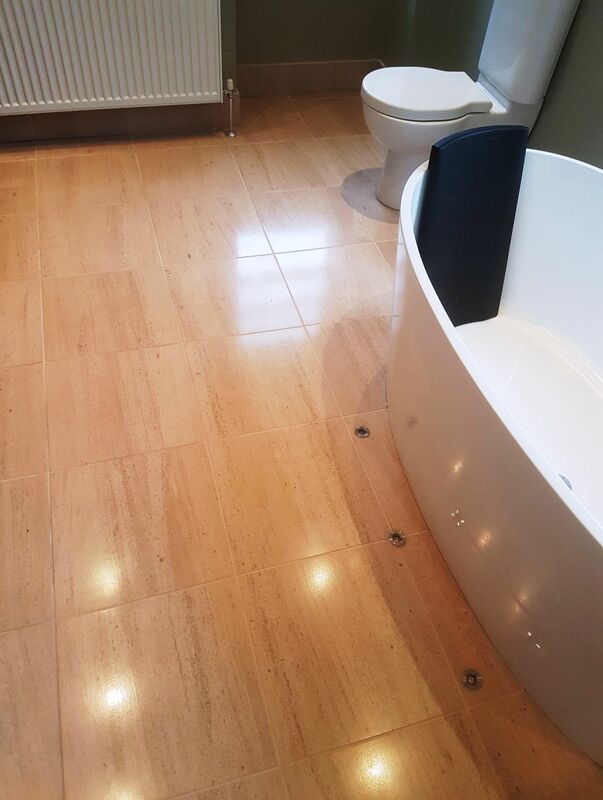 The property owners had spent many hours over the years cleaning and sealing the floor to maintain its condition, but while the tiles were in certainly in good shape, they had lost their shine and lustre. The result was quite a dull looking floor that could certainly be improved on. 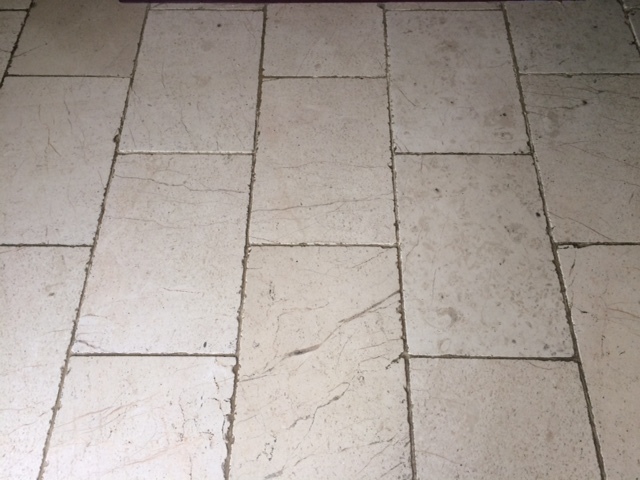 When the property owners contacted me about the problem, I informed them that due to the hardness of the stone only a process known as burnishing, which involves cleaning and polishing with special gritted pads instead of a liquid product, would do the trick to restore the Limestone tiles. We use burnishing to restore several types polished stone to looking their best, including Limestone, Marble, and Travertine. Tile Doctor’s burnishing system consists of four diamond encrusted twister pads with varying levels of grit. The pads are graded so that each hones the stone to a greater degree than the previous one, resulting in the build-up of a durable polish and shine on the stone. Using a small amount of water as lubrication, I worked my way through the system, applying each pad in succession, beginning with the Coarse grit pad, before on to Medium, Fine and Very Fine pads. 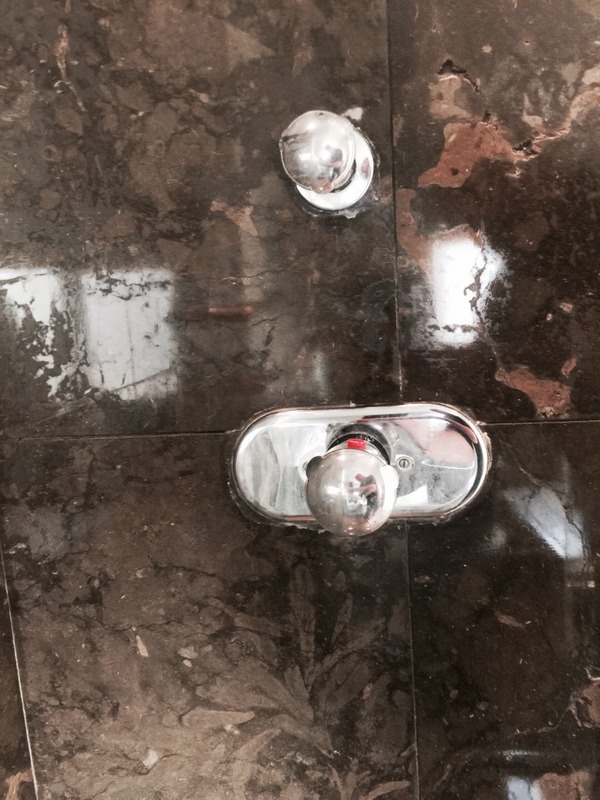 While polishing the tiles, the diamond encrusted pads also serves to break down any dirt. Thankfully, these tiles were already well taken care off and were not currently suffering from heavy soil build up. After completing the burnishing process, I promptly rinsed away any cleaning slurry and left the floor to dry. I returned the property once the floor had dried completely to seal the tiles, with my choice of sealer being Tile Doctor Colour Grow. I applied three coats of the sealer to the tiles, before buffing them for a final time. Colour Grow is an ideal sealer for Limestone for two main reasons. Firstly, it is an impregnating sealer, meaning it penetrates deep into the pores of the Limestone to provide robust protection against ingrained dirt. Secondly, it contains colour intensifying properties which enhance the natural colours in the Limestone. 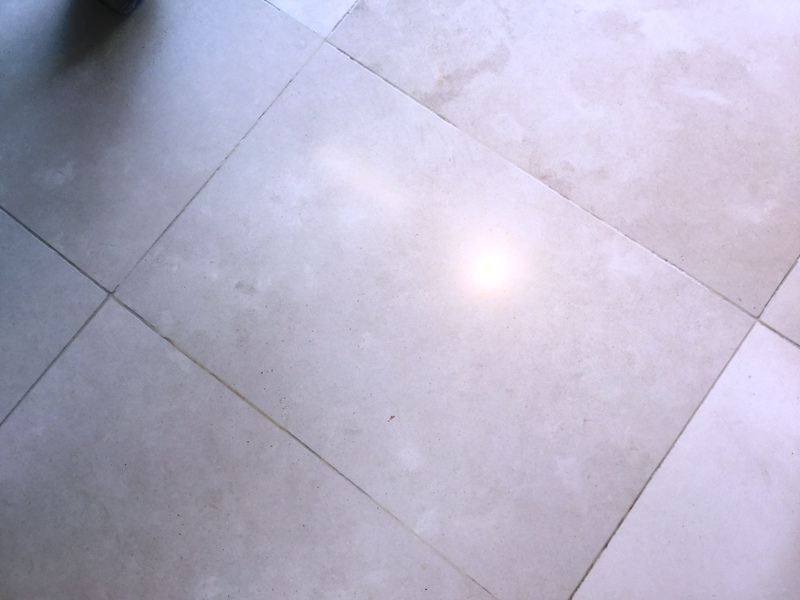 I took a couple of photographs before and after (above) in which you can see a significant improvement in the shine and lustre of the Limestone tiles. 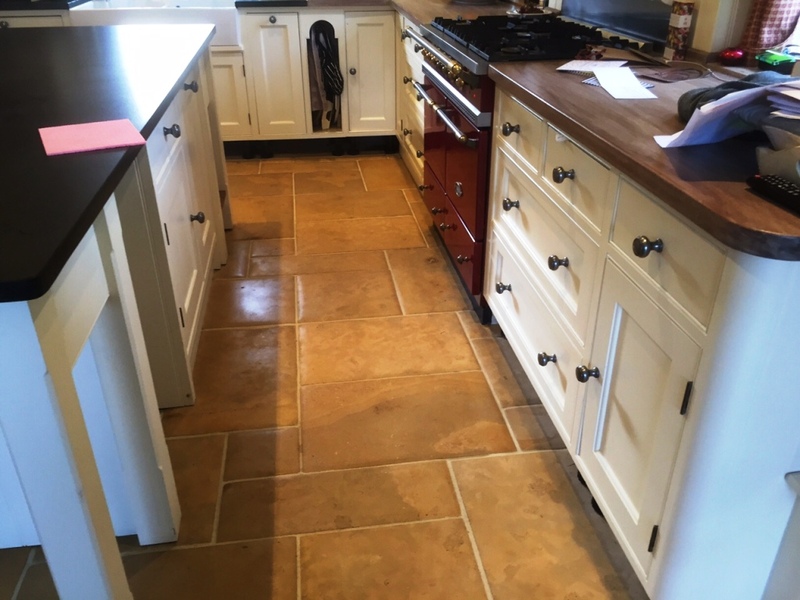 Most of the cream and tan shades in the Limestone were practically invisible before the burnishing was carried out and a fresh seal was applied – now the tiles stand out as the most prominent feature of the room. Needless to say, the customer was very satisfied. Knaresborough is a historic town in North Yorkshire, popular amongst holiday goers for its numerous attractions. 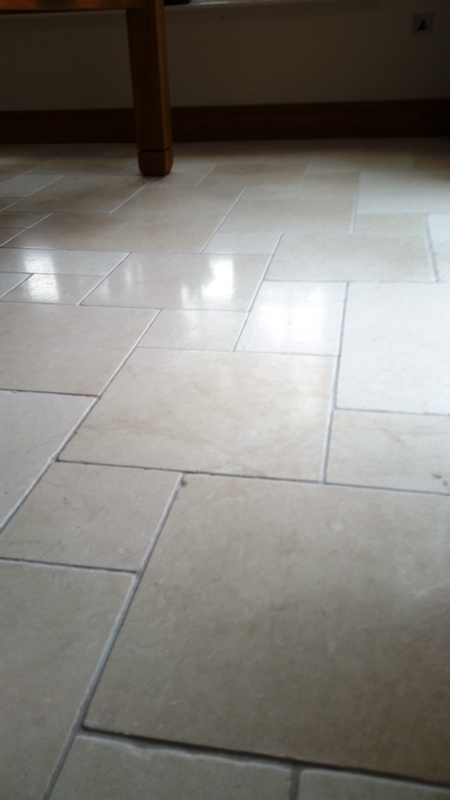 I travelled to the area not to visit the attractions, however, but to visit a customer, whose fantastic white Limestone tiled floor was in need of a deep clean. 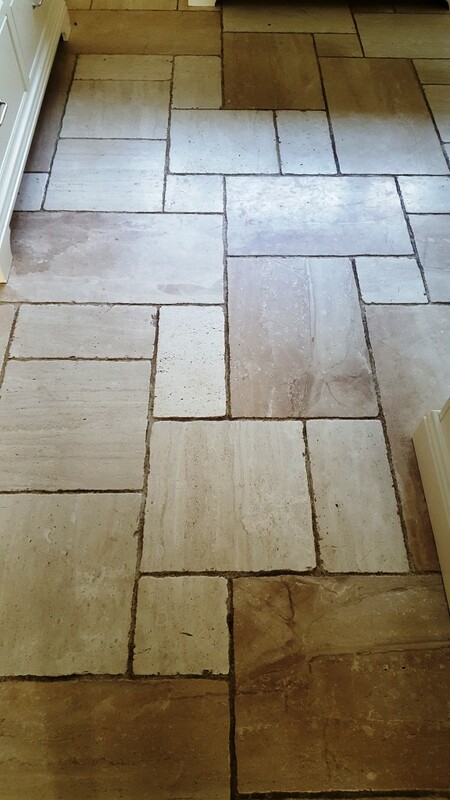 Limestone is a porous material, meaning that without a sealer dirt can become easily trapped in the pores of the stone, as well as the grout. 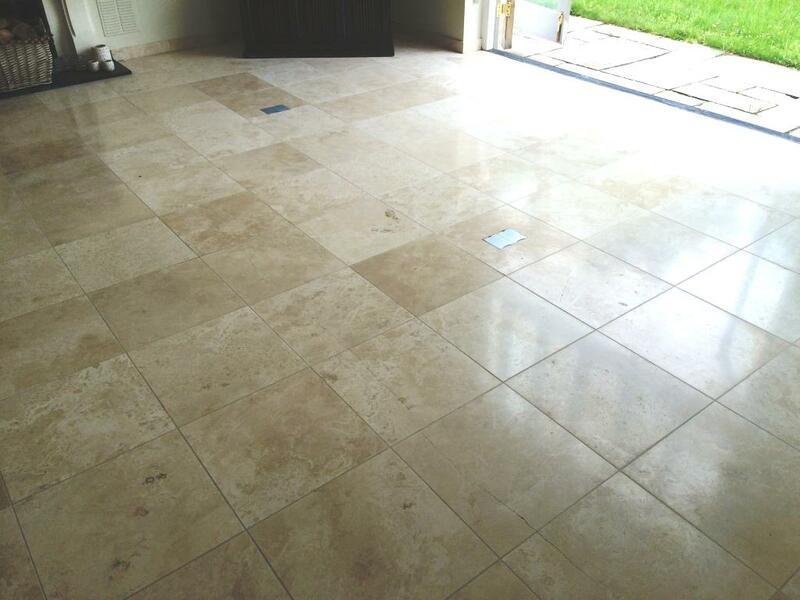 With this Limestone being naturally white, the dirt was particularly visible, making the tiles look very unsightly. 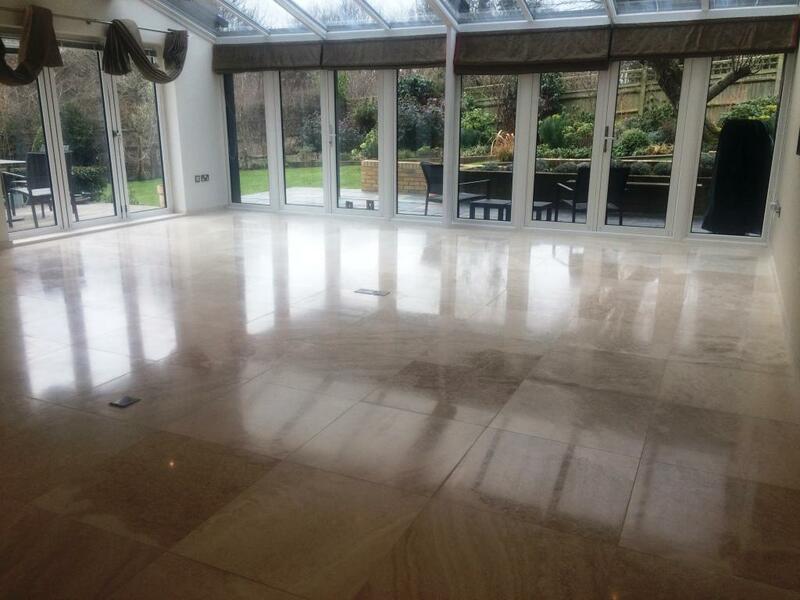 Once deep cleaned the floor would also require a fresh seal to provide long-term protection against muck and stains. 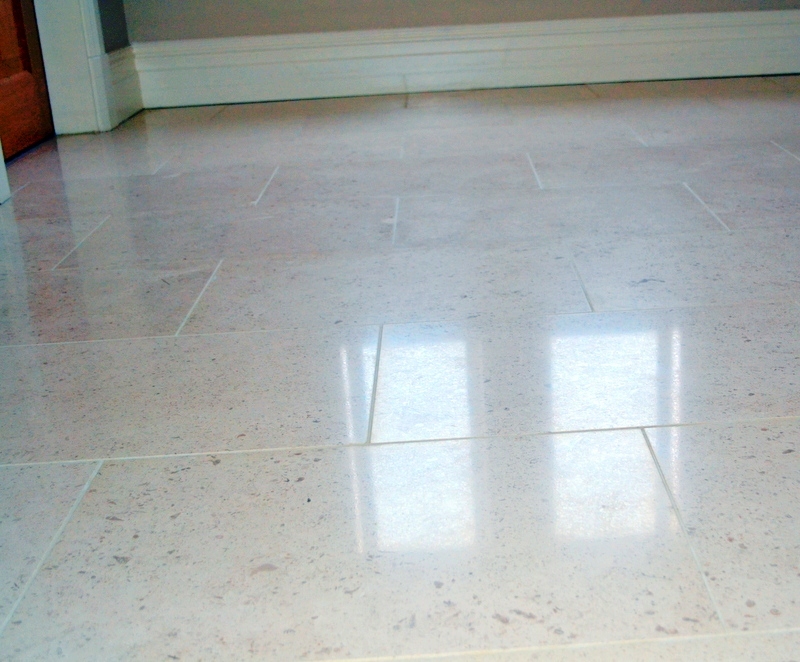 To treat high end, polished stone floors such as Limestone and Marble, we recommend using the process of burnishing. Simply put, burnishing involves the application of diamond encrusted pads of varying grits, which serve to break down dirt and then polish the stone. Typically, we use a set of four pads in gradual succession; here, I used the first three pads on the first day. Starting with the Coarse grit pad, along with a little water as lubrication, I polished the Limestone, before repeating the process with Medium and Fine pads to refine the polish. On the same day, I also cleaned the grout using a solution of one part Tile Doctor Pro-Clean (a high alkaline cleaner) and three parts water. 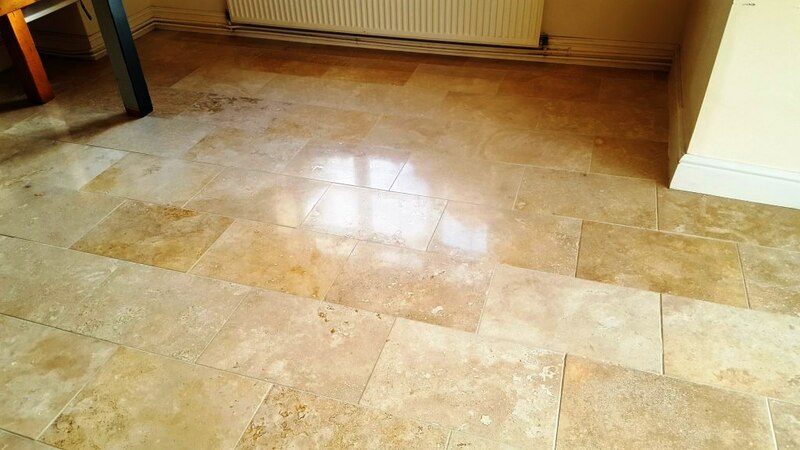 On Limestone floors you should take care to avoid even mildly acidic cleaning products as sensitive stones like Limestone and Travertine can be damaged over time. After successfully cleaning the dirt grout lines, I rinsed the floor before using a wet-vac machine to soak up the residue. The floor was then left to fully dry overnight. The next day, I returned to the property to complete the restoration. Before sealing the tiles, I applied the fourth and final of the burnishing pads to achieve a Very Fine polish. To seal the tiles, I used Tile Doctor Ultra Seal, the customer didn’t want to darken the stone in the way that a colour enhancing sealer might. Additionally, the customer required a more natural finish, which this product provides. Then, I polished the excess sealer off with a white buffing pad and left it to dry for an hour, before polishing a final time with the Very Fine grit burnishing pad. With this method, the floor was perfectly dry and the customer could walk on the tiles as soon as I left. Before leaving my very satisfied customer to enjoy their newly restored Limestone floor, I made sure to impart some aftercare advice. 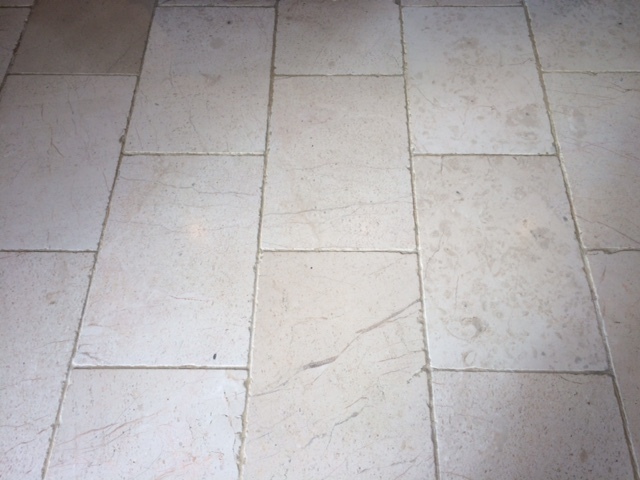 I recommend Tile Doctor Stone Soap for the Limestone (and other polished stone) as its helps to retain the sheen whilst also acting as a general cleaning agent. Sometimes, Tile Doctor customers will have more than one tiled area in need of professional maintenance. At this house in Wandsworth, South London; I was commissioned to clean and seal firstly a Limestone tiled kitchen floor, and a Limestone tiled shower unit. 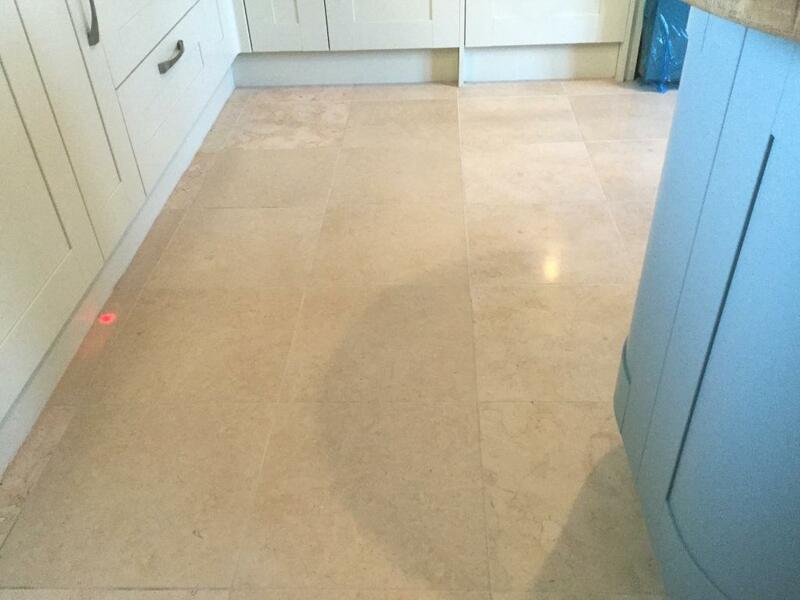 I started with the Limestone tiled kitchen floor which, like many other stone floors had not been treated to the correct regular care and had become dull and dirty over time as a result. My first task involved applying Tile Doctor Remove & Go stripper in order to break down any old surface sealant and dirt. Then, I began the burnishing process, which essentially involves polishing with pads of varying grit. I started with a Medium 800 grit burnishing pad to provide an initial polish and grind away ingrained dirt, before refining this with a Fine 1500 grit pad to achieve a smooth surface. The burnishing pads are used in combination with a small amount of water. After leaving the floor to dry for 24 hours, I sealed the tiles with Tile Doctor Colour Grow. This will provide durable surface protection for the future and also further accentuate the great natural shades in the Limestone. To add the finishing touches, I buffed the floor with a soft white buffing pad. During the time it took for the Limestone tiled kitchen floor to dry, I set my sights on tackling the shower unit. The unit was suffering from a terrible amount of limescale, which would need to be removed using a set of hand held burnishing pads. Limescale deposits build up on surfaces which come into contact with hard water, and can become very unsightly if not dealt with promptly. This proved to be a more awkward job thanks to the intricate Limestone fittings on the shower walls. I used the smaller 6-inch burnishing pads fitted to a hand buffer, while for the kitchen floor I naturally used the larger sized pads attached to a heavy weight buffing machine. With the limescale as bad as it was, I started to grind it off with a Very Coarse 120 grit burnishing pad, before working my way up gradually through the system of pads – each time using a slightly finer grit pad until I finished with the Ultra Fine 3000 grit pad and the surface finish had been restored. Following this, I removed the silicone sealant around the shower fittings, and dealt with the mould growing behind it. On the second day of work, I sealed both the kitchen floor and the shower unit. 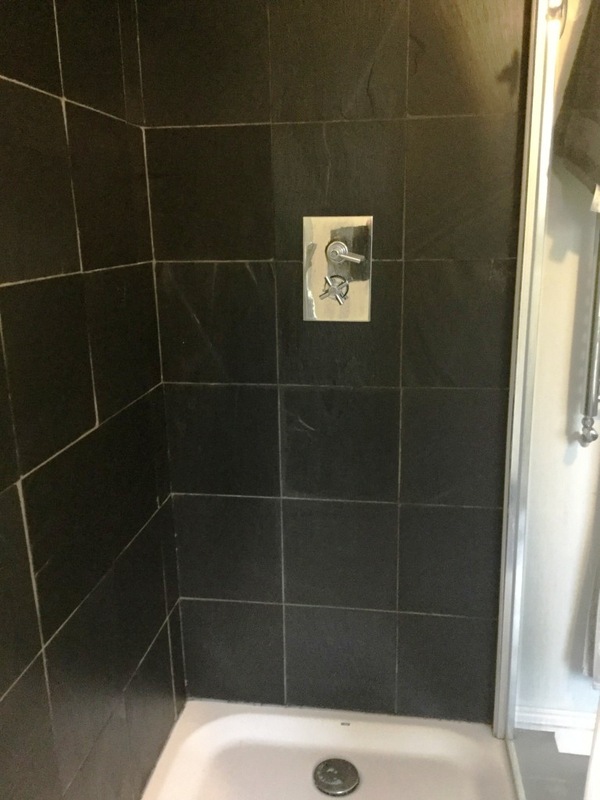 Much like the kitchen floor, the shower unit was sealed using Colour Grow to ensure long lasting protection, and fresh silicon was also fitted. Two days of work and two rejuvenated Limestone features later, I was left with a very happy customer. 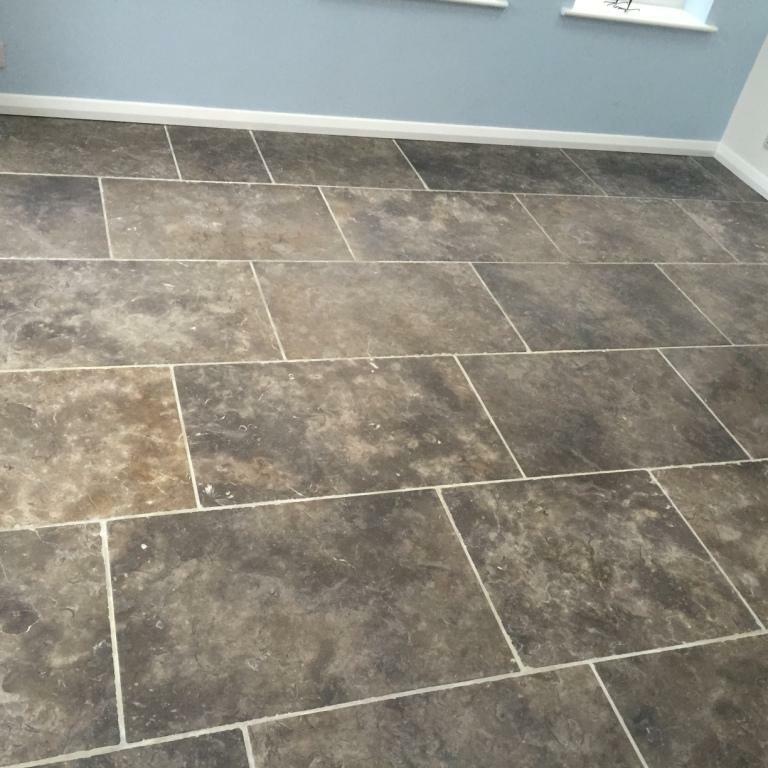 This beautiful Grey Limestone tiled floor in the small village of Barton had been installed by a tile company but had not been treated in any way. 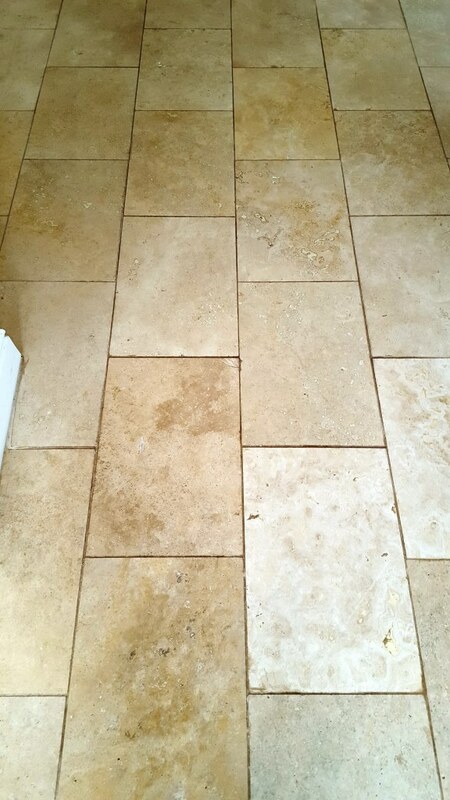 The customer had been told by the tile shop that the stone in question would have to be sealed. After doing her own research and finding us at Tile Doctor I went to see what could be achieved. 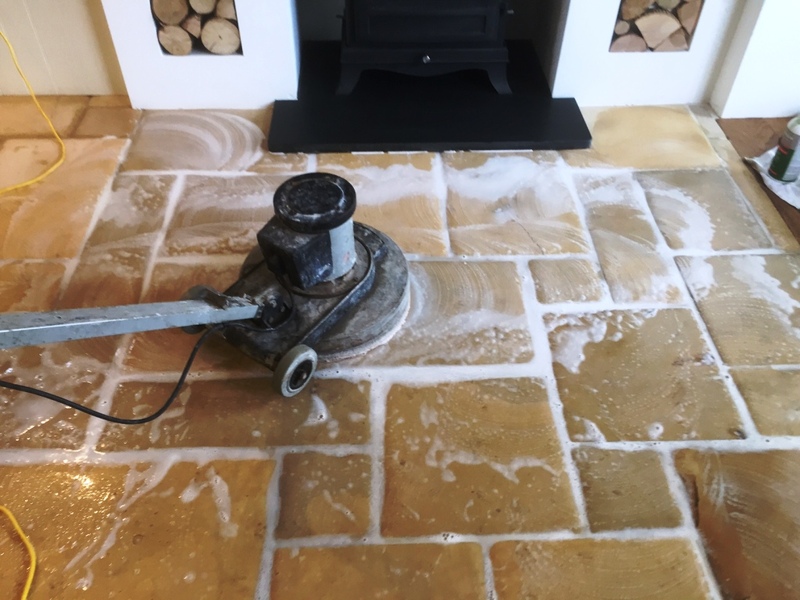 As the floor was new I was able to get straight into polishing the Limestone with a set of four diamond encrusted Burnishing pads fitted to a rotary floor machine. I started with a course burnishing pad lubricated with a little water and then this was followed by the medium, fine and very fine pads to achieve the desired effect giving the floor a quick rinse in-between each pad. As you can see from the photographs going over the full floor with each pad I managed to achieve a great polish on the floor and it was soon ready to be sealed. 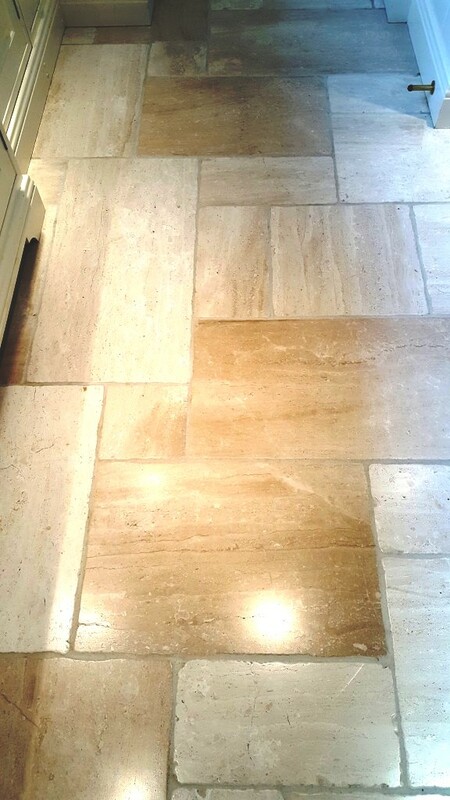 After polishing, the only task remaining was to provide the floor with a durable seal that would protect the Limestone from staining. 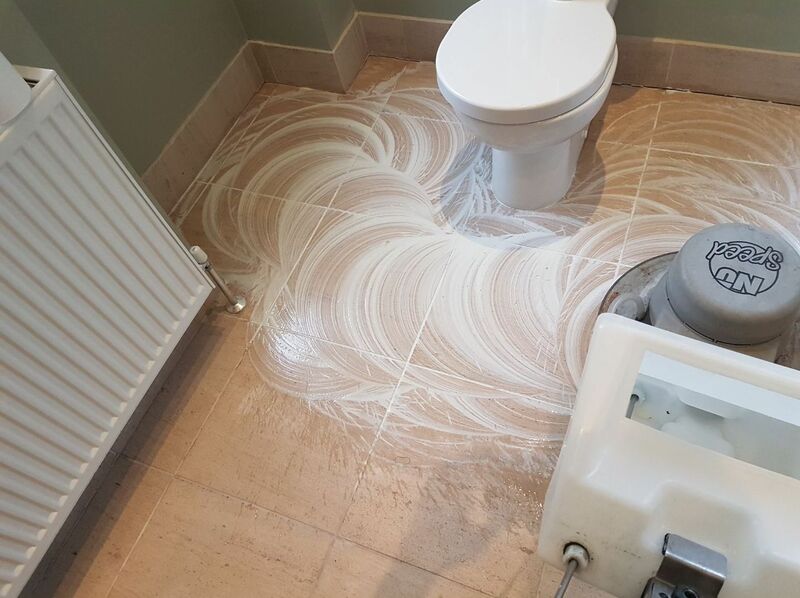 I did this by applying a couple of coats of Tile Doctor Ultra Seal, which is a premium, natural-look penetrating sealer that is specially designed to provide maximum stain protection from within. 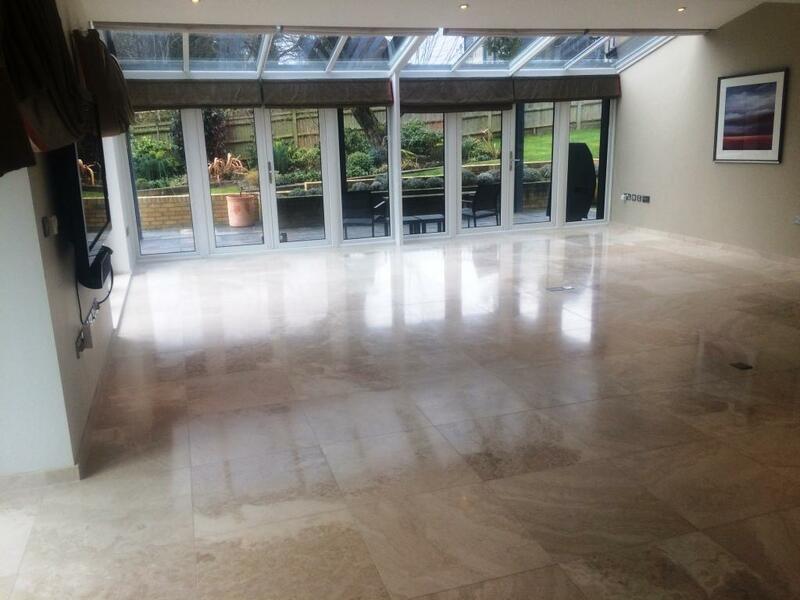 This customer owned a large house in Uckfield, East Grinstead with honed Limestone tiled flooring throughout the whole downstairs, which comprised the living room, dining room and kitchen. 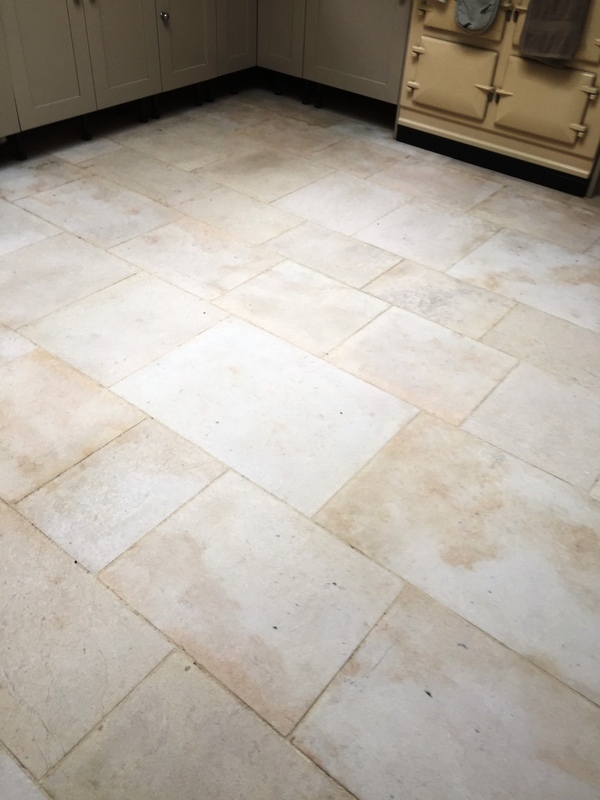 The Limestone floor was in good condition and had been treated to regular professional care, however, the customer wanted the floor to be pristine and I was asked to further refine the appearance of the floor. Limestone is a very tough stone so this is done primarily through the process of burnishing using diamond encrusted pads. I began with the dining room area, first shifting the furniture out of the way to allow space for the burnishing to take place, before bringing in my three main tools: the buffing machine, a set of four diamond burnishing pads, and the wet-vacuum. To start the process, I attached the red coarse grit pad to the buffer, and then, using a litre of water per square metre as lubrication, I cleaned and stripped away any existing sealer. Since, Limestone is particularly porous, I limited myself to working on nine tiles at a time. Once I’d removed any excess residue with the wet-vacuum, I changed to the blue medium grit pad, repeated the cleaning process, and again soaked up the soiled residue. Finally, I completed the process once more with the yellow fine grit pad. Once this was completed I buffed the floor with a soft white pad to clean up any dried residue, leaving it ready to be sealed. Two days later, once the floor was completely dry, I returned to the property to seal and polish the floor. To begin, I restored the shine to the tiles by applying the last of the four burnishing pads – the green very fine grit. 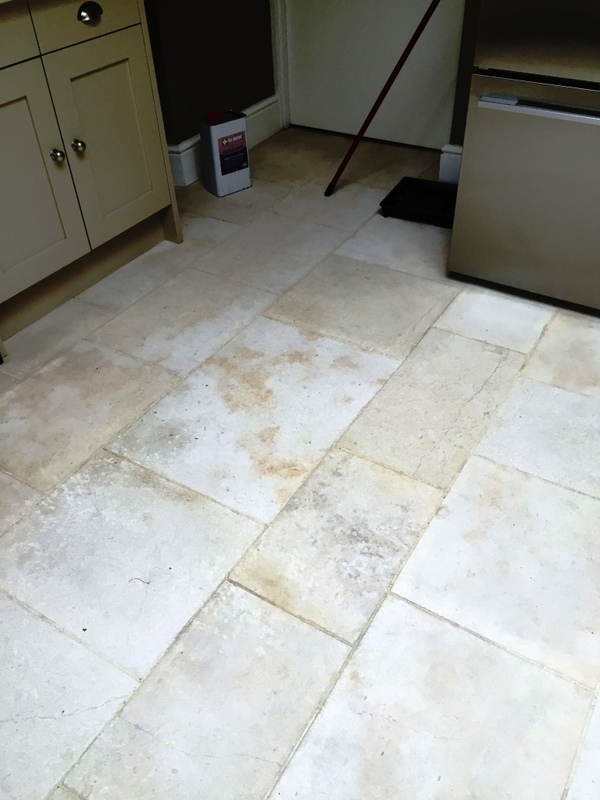 I then used the three cloth method to apply Tile Doctor Ultra Seal, a solvent-based, impregnating sealer that soaks into the pores of the Limestone to provide durable protection against ingrained dirt. Colour enhancing sealers such as Tile Doctor Colour Grow were available to the customer, but he stated that he was very happy with the current appearance and wanted the more natural look. After an hour, the floor was ready to be buffered once again with the very fine pad, which I attached to a hand held buffing machine to work around the corners and electrical sockets. Given the size of the property, this job took me three days – a day spent in each room. 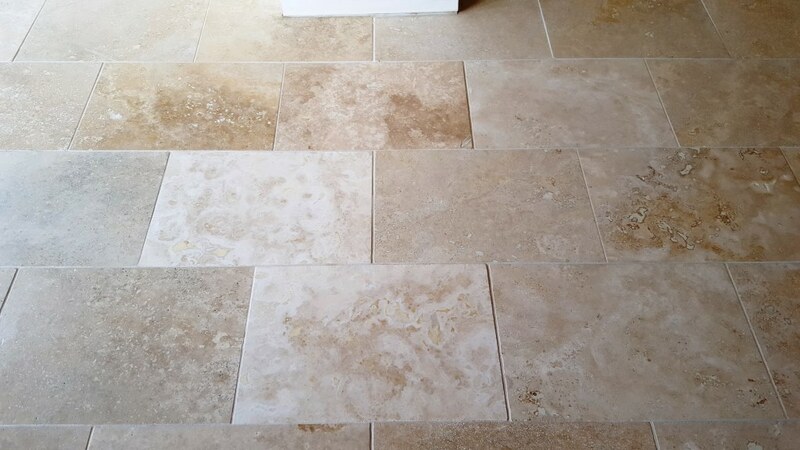 The customer was very exact with his requirements, and was very happy with the results, being left with fantastic looking Limestone tiles throughout the entire downstairs of the house. The recent winter floods had a devastating effect on Cumbria, with many houses suffering severe damage from exposure to the water. 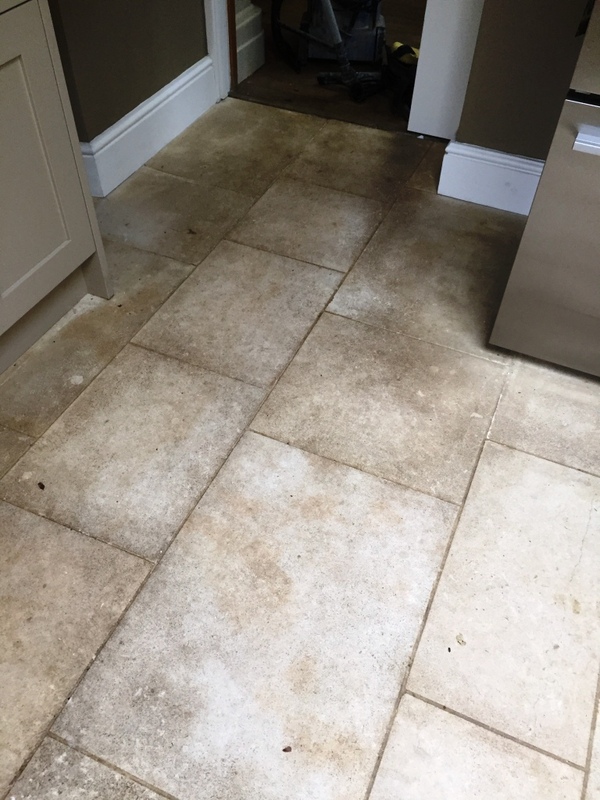 This property in Kirkby Lonsdale had been flooded, and while the contract cleaners had made some basic repairs, the Jura Limestone floor had been left dull and patchy, and in dire need of a professional restoration. 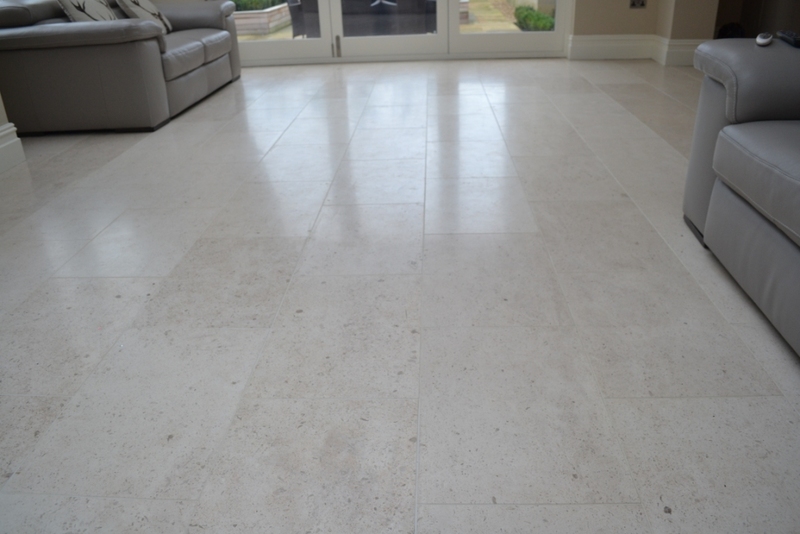 Jura Limestone has been in use for over 180 million years and is an absolutely top quality stone, consisting of up to 97% dense calcium carbonate. 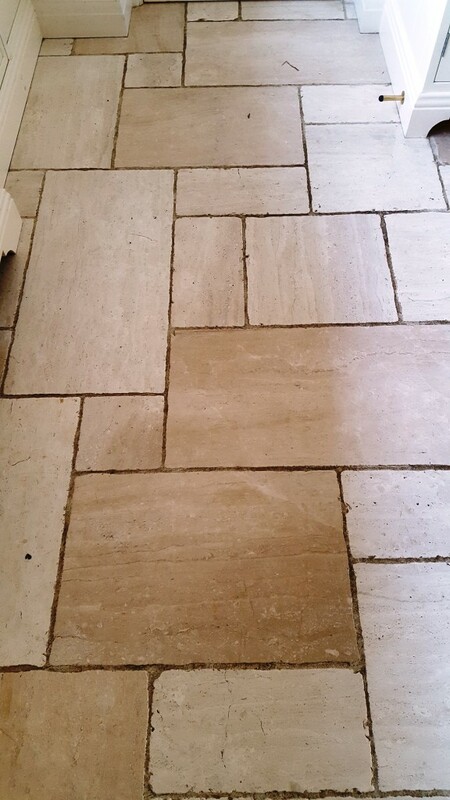 Thanks to its density it is far less porous than other types of Limestone available on the market. Generally speaking, this makes it easy to look after as it is more difficult for dirt to become ingrained. To restore the surface of the floor we used a process known as burnishing, which achieves particularly good results on polished stone tiles. It involves the application of several burnishing pads with different grades of grit to break down any old sealer and dirt, and to gradually smooth and polish the rough surface of the tiles. In this case, I worked my way through through the four pad system, starting with a Coarse pad lubricated with a little water before moving on to Medium, Fine and Very Fine pads to achieve the desired polished finish. 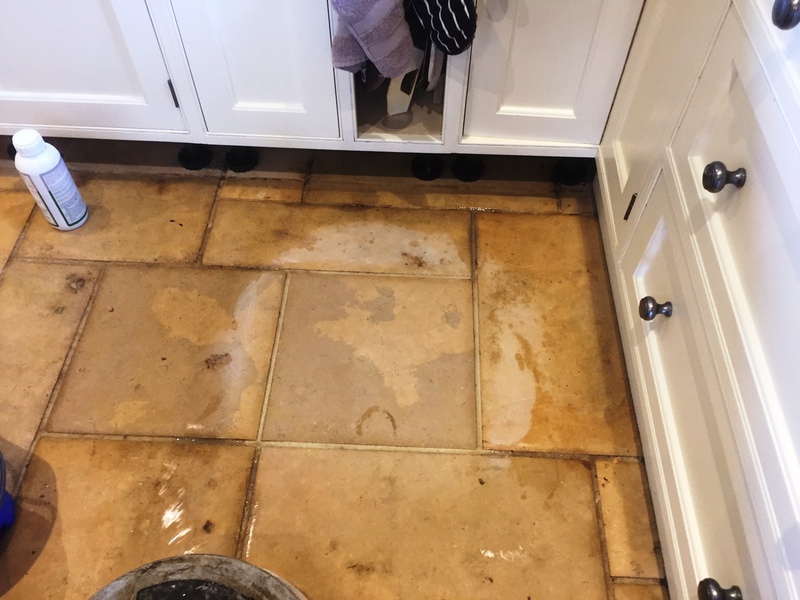 Following this, we decided that the grout would also benefit from a special clean with Tile Doctor Pro Clean, and so applied the high alkaline cleaner to tackle the outstanding stains and dirt. The whole floor was then rinsed with clean water to remove any remaining slurry and then left to dry. We returned to the property the following day, by which time the floor had dried completely. I gave the tiles another polish with an Extra Fine burnishing pad, before proceeding to seal the floor with two coats of Tile Doctor Colour Grow. This is an impregnating sealer that soaks into the pores of the stone to provide durable protection whilst enhancing the natural shades in the Limestone. Finally, I gave the floor one last polish with the Extra Fine burnishing pad just to tighten up the hone and polish off any extra sealer. 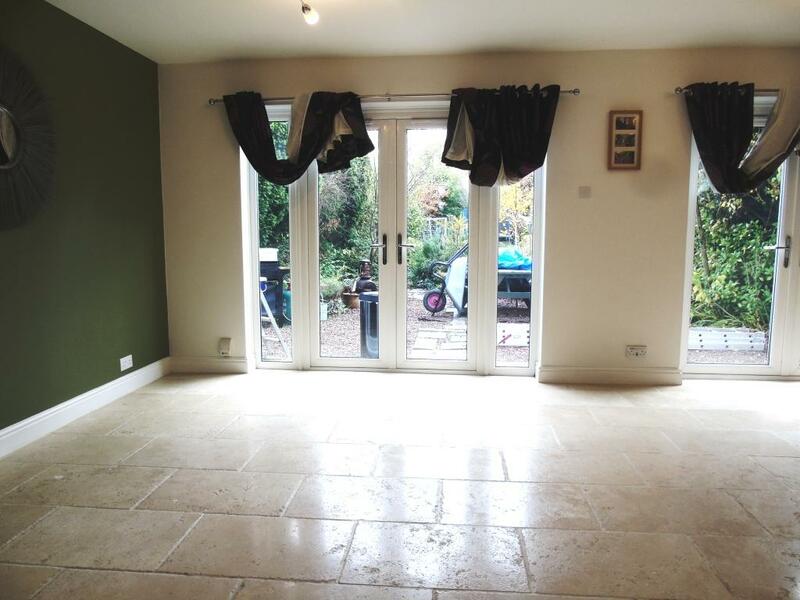 You can see the results in the corresponding photographs, and needless to say, the customers were exceptionally pleased to have their fantastic floor back to looking its best, especially considering the significant damage caused by the floods. 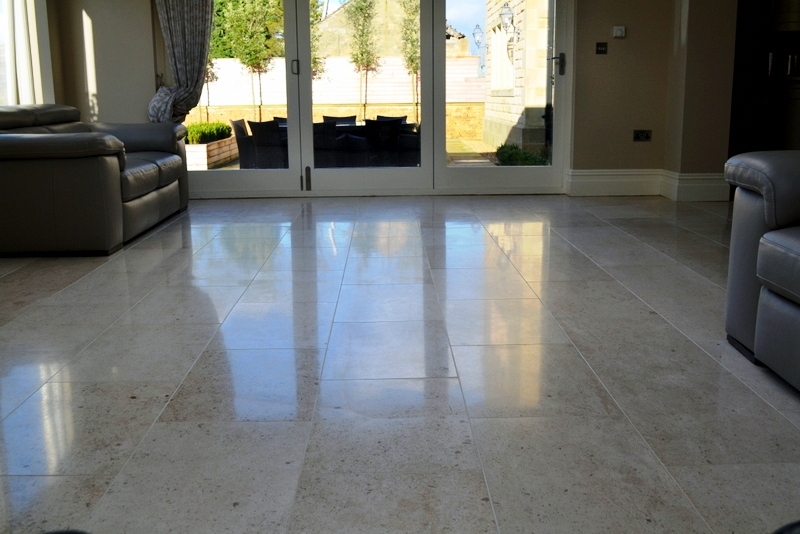 When given the right care, a polished Limestone floor can be an amazing asset to any house. If neglected, however, the tiles can quickly discolour from wear, especially in areas of high traffic, such as the kitchen. Such was the case at this house in the small, picturesque town of Cowbridge, in South East Wales. 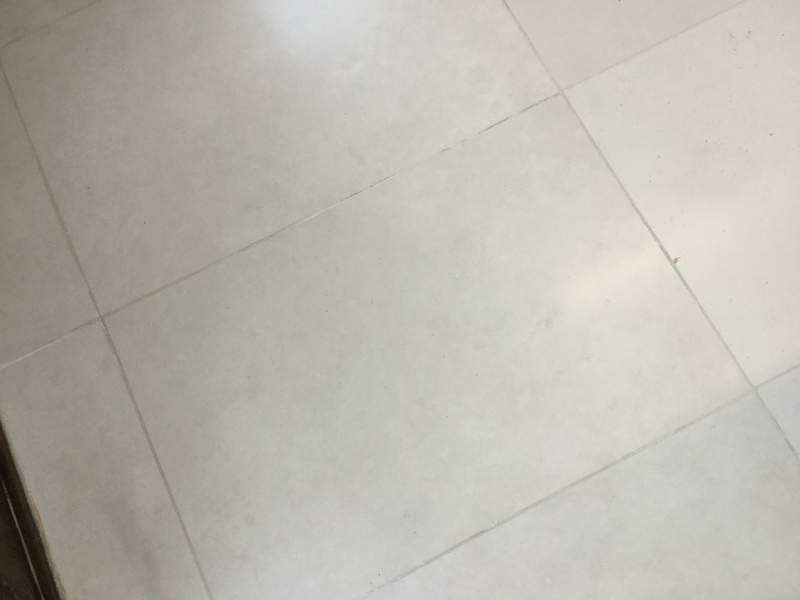 My client had contacted Tile Doctor to see what could be done to improve the condition of the tile and grout which, as you can see from the photographs had not been properly maintained. 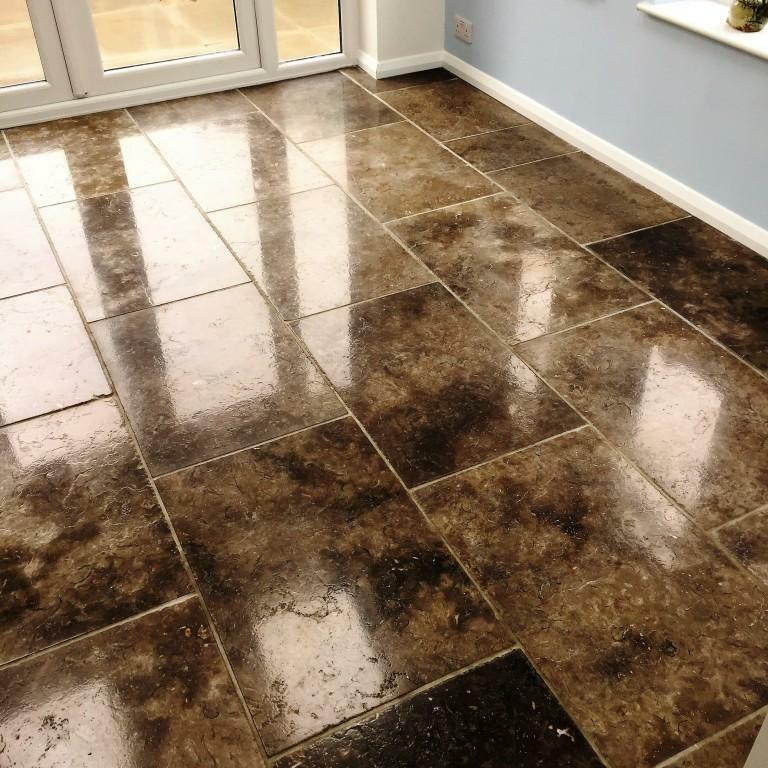 To get the floor back to its best it would need to be burnished which is a process that rejuvenating the appearance of polished stone through the application of different grades of diamond encrusted floor pads from coarse to very fine. Before beginning the burnishing process, I made sure to check that there were no inherent moisture issues using a damp meter, the home owner had informed me beforehand that the floor did have a damp proof membrane installed however it is always a good precaution to check and additionally it provides a good baseline for later when checking the floor has dried after cleaning. The Tile Doctor burnishing system consists of four main burnishing pads. I began by applying the coarse pad to the tiles lubricated with a little water, before rinsing the floor and moving on to medium and fine grit pads again lubricating with water and rinsing after each pad. After finishing with the third pad, I paused to rinse the entire area a thorough rinse extracting the resulting waste with a wet-vac machine. I then paid special attention to cleaning the grout lines, which had turned black in places. I applied undiluted Tile Doctor Pro Clean and agitated the grout lines with a stiff scrubbing brush to restore the original colour. This was followed by another thorough rinse. I left the floor to dry overnight, before completing the burnishing process by applying the final very fine grit pad which adds that aesthetically pleasing shine. I used the damp meter to check the floor had dried and once I was happy I began the sealing process with the application of three coats of Tile Doctor Colour Grow. Colour Grow is a great choice for Limestone as it penetrates into the pores of the stone protecting it from within whilst enhancing the natural colours in the Limestone. As a final step and to ensure there were no unappealing marks left on the floor, I went back over the floor once more with the fine grit burnishing pad. What was once a dull stone floor with dirty grout lines has now been restored back to its original condition and with the correct maintenance going forward should stay that way for some time.